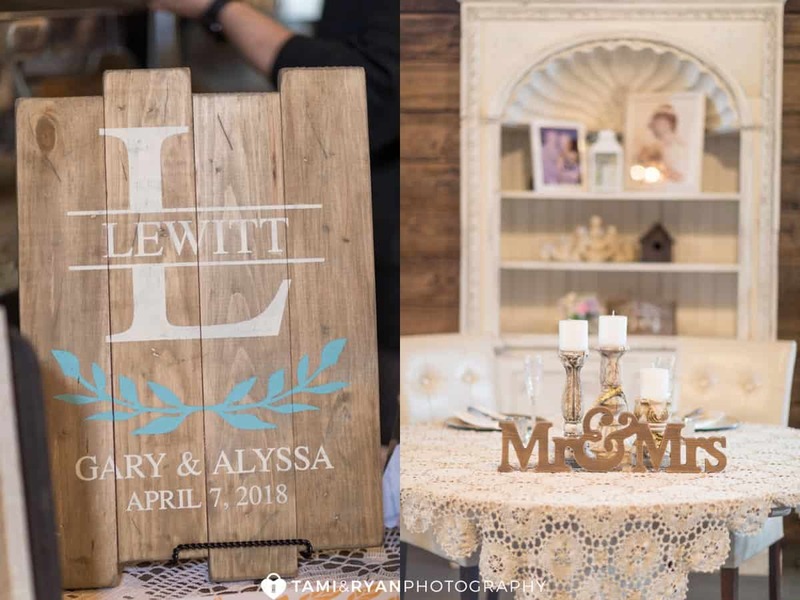 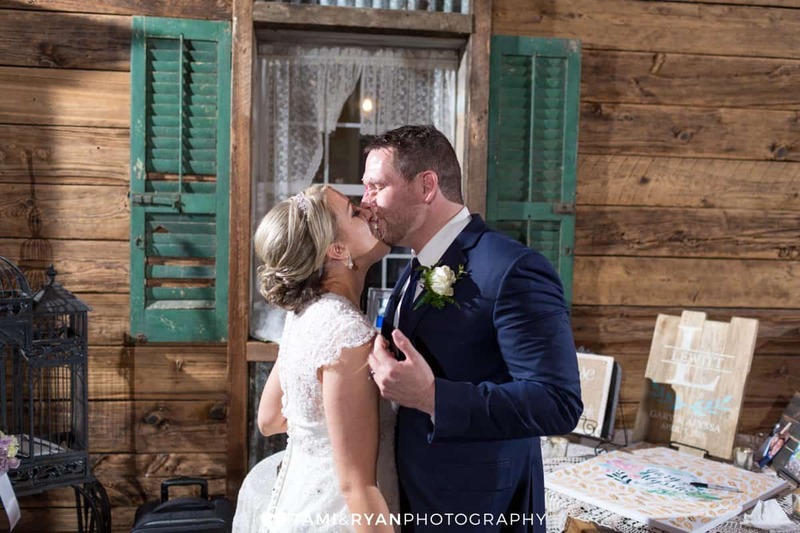 Alyssa and Gary lucked out and had a perfect Spring day for a Rustic Cecil Creek Farm Wedding that incorporated her unique style as well as little rustic details along the way! 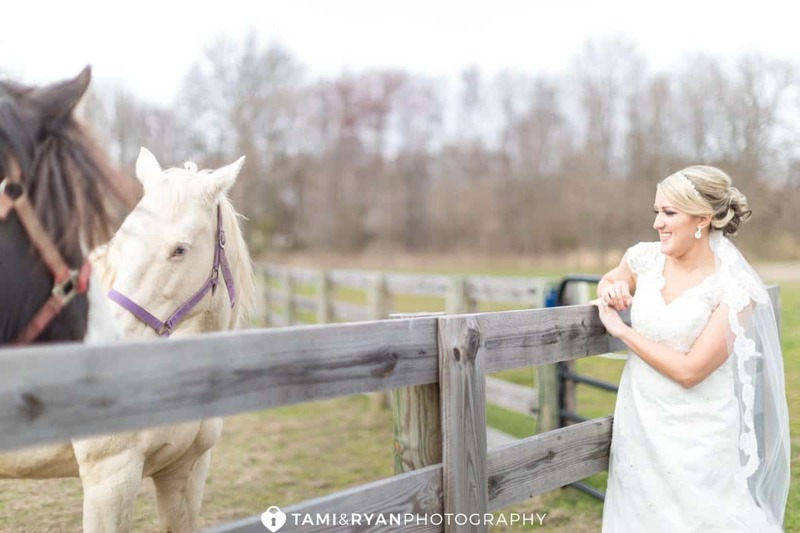 We have been looking forward to this day since their engagement session at Cecil Creek Farm this past summer. 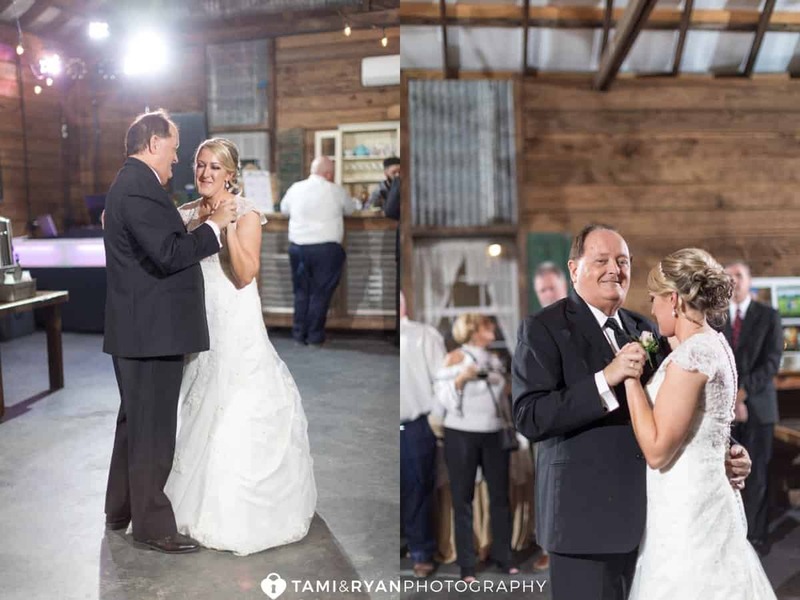 We loved getting to know Alyssa and Gary. 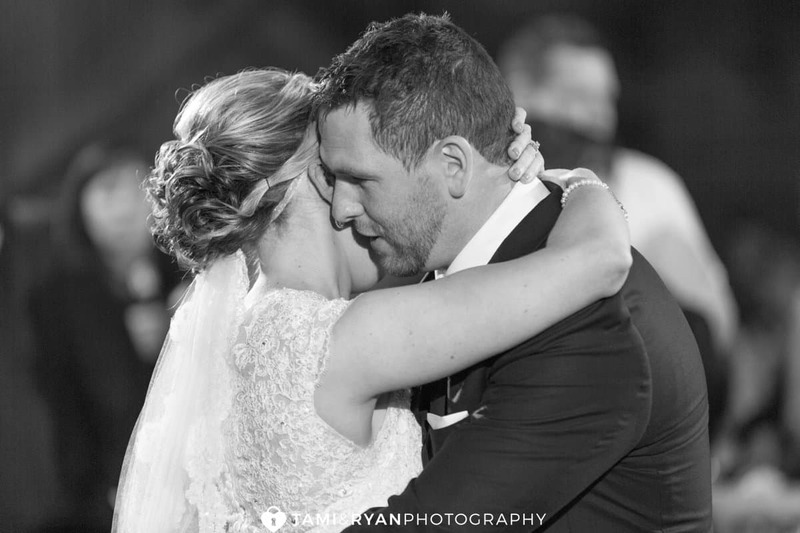 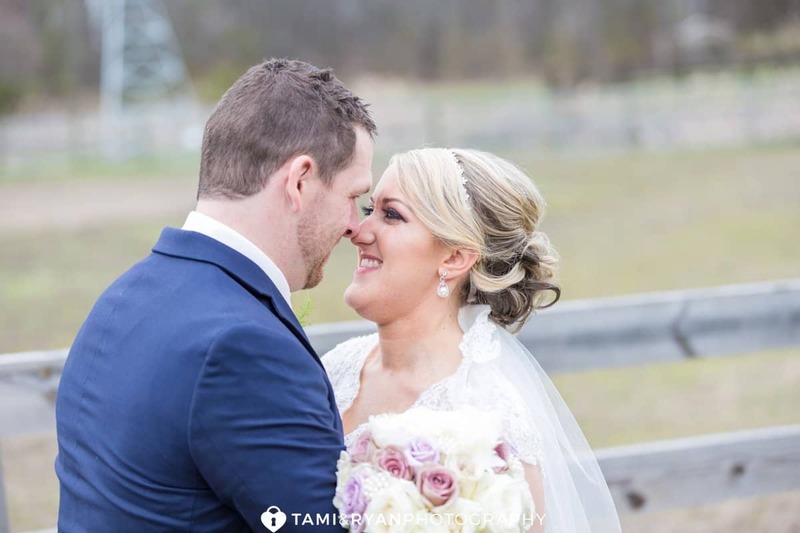 Their love is so infectious and we loved having the honor to capture them, along with their closest family and friends. 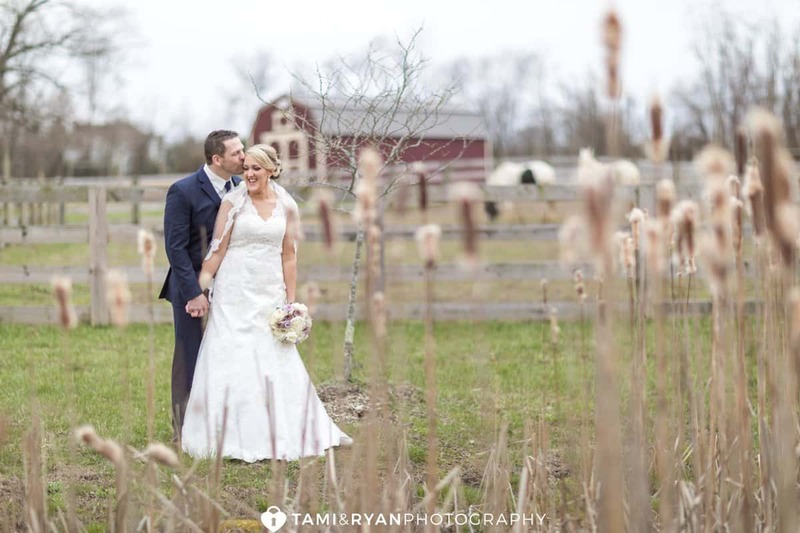 Alyssa and Gary’s perfect wedding day was a little rustic, a little classic but a whole lot filled with love! 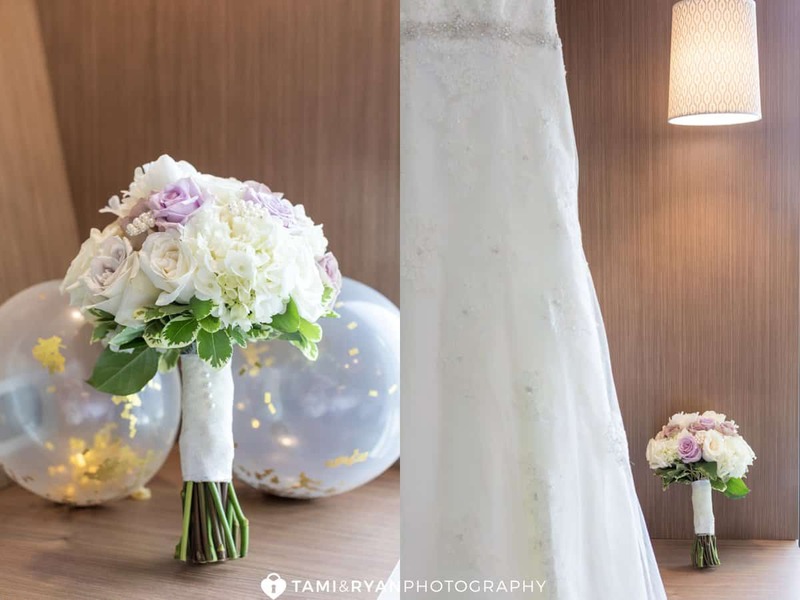 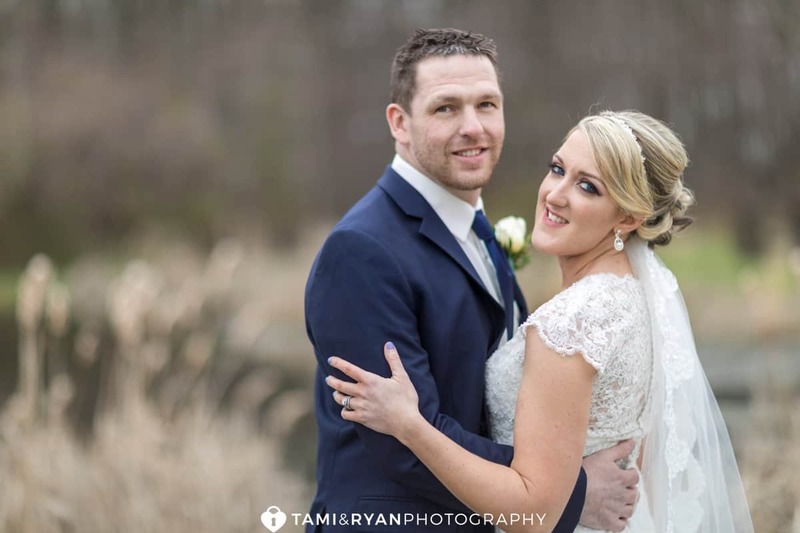 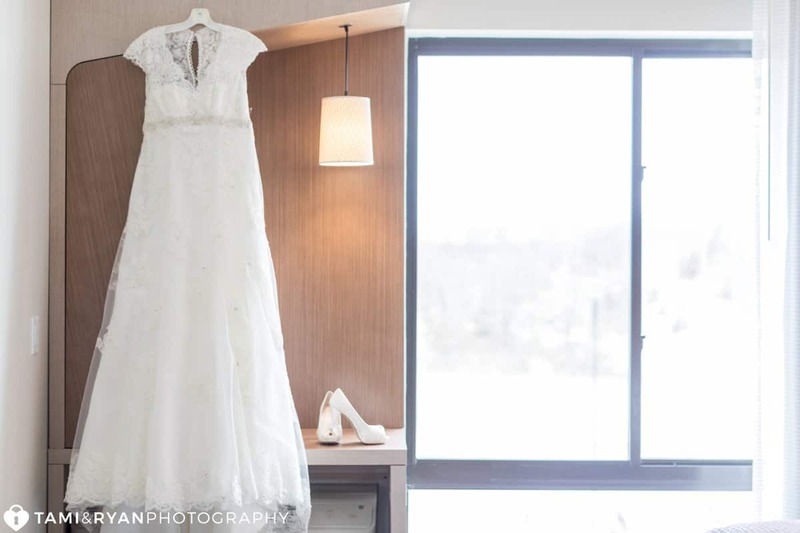 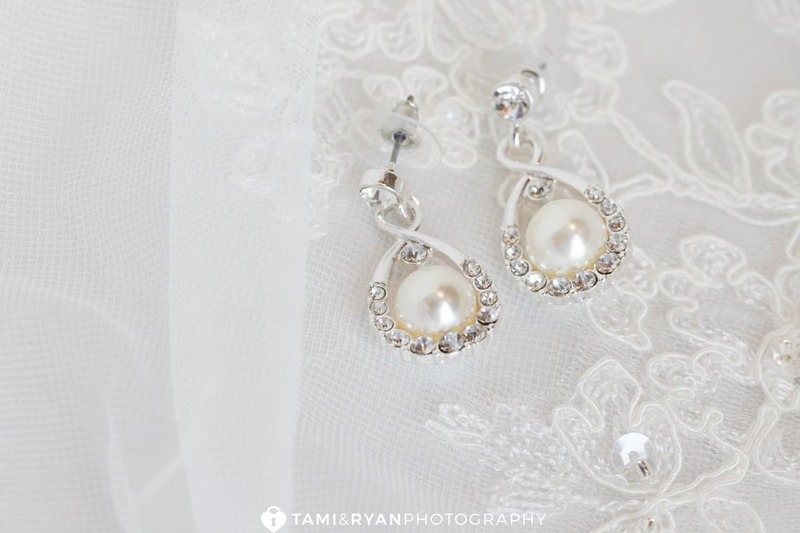 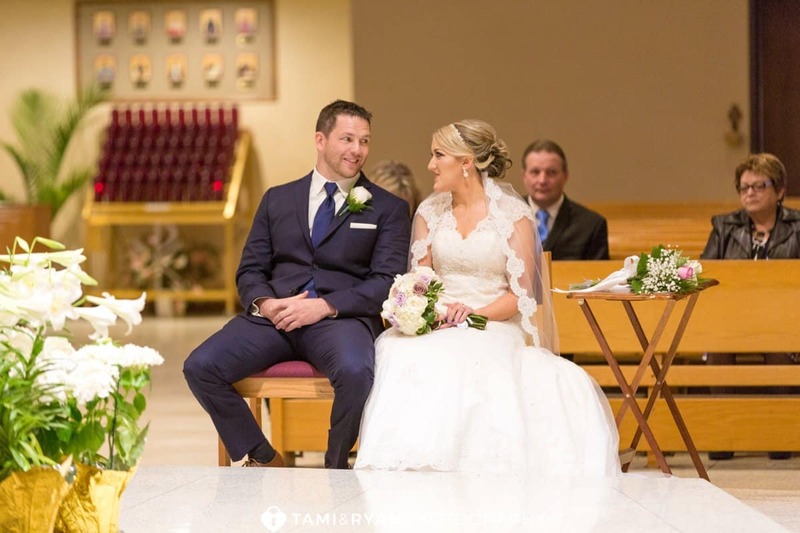 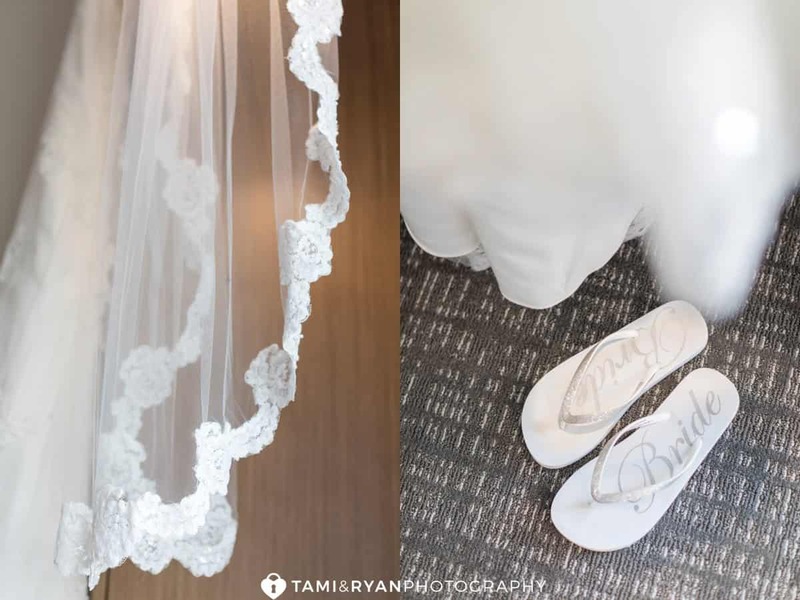 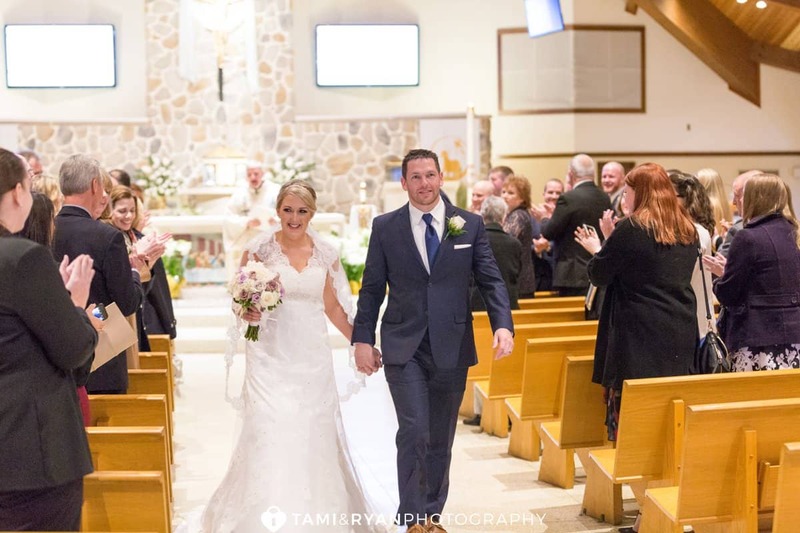 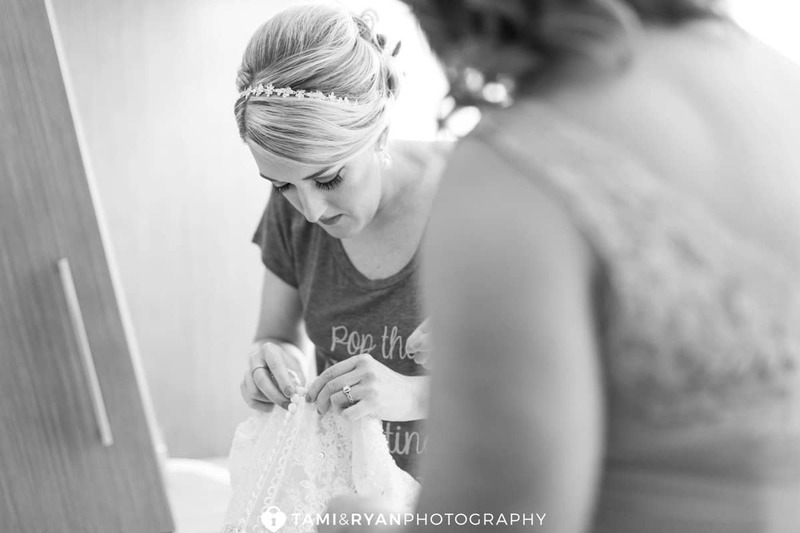 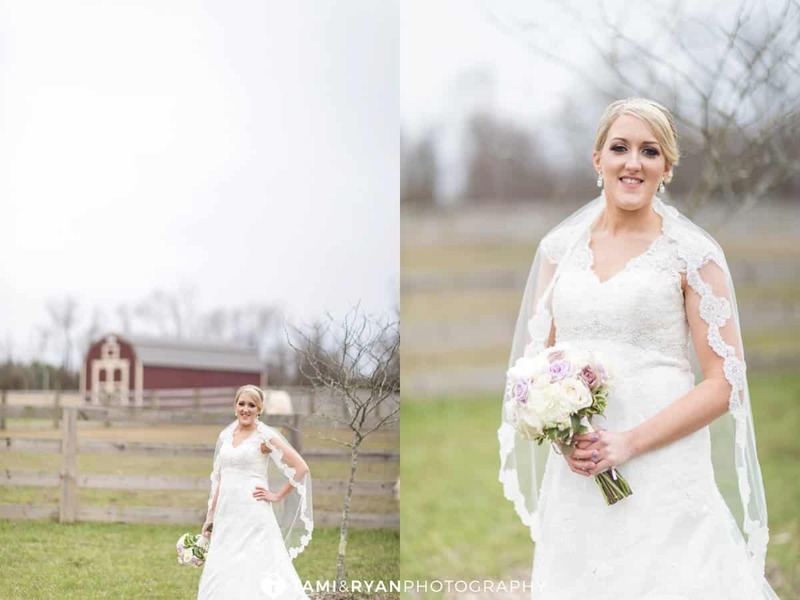 Alyssa’s bridal gown was purchased from David’s Bridal with beautiful lace as well as a little bit of bling. 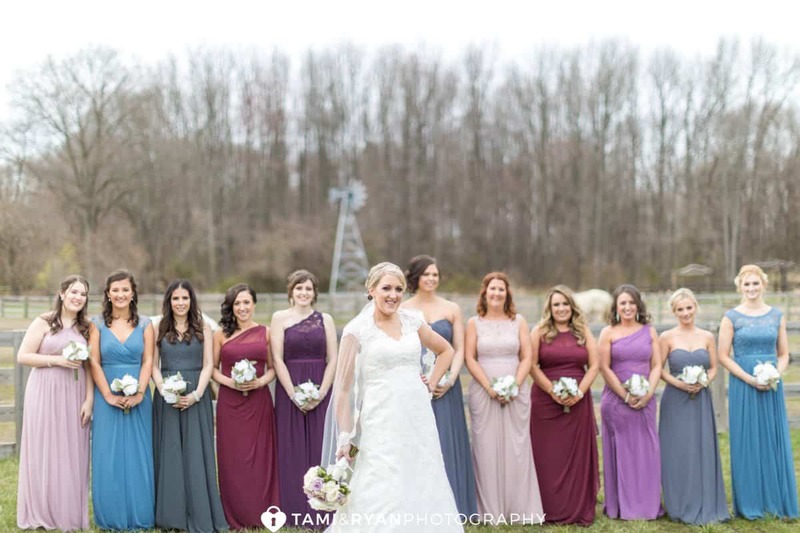 The bridesmaids dresses also came from David’s Bridal in all different colors to go with Alyssa’s rustic feel for her wedding day. 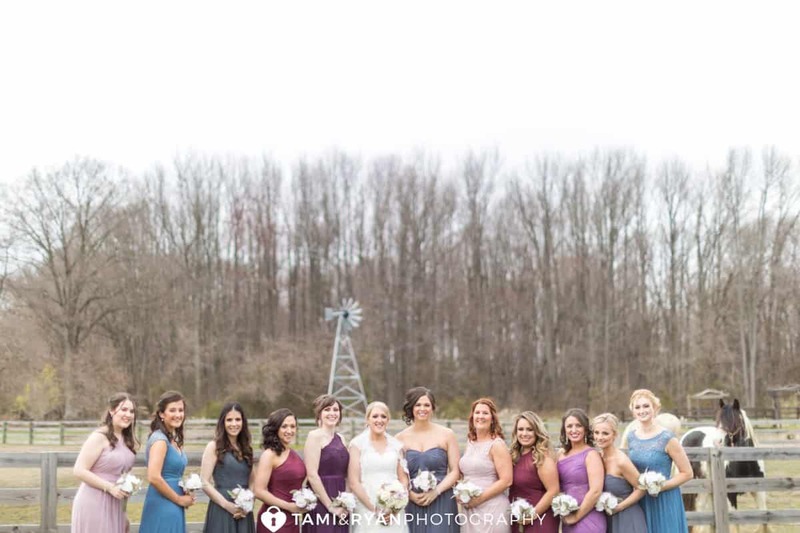 They looked absolutely beautiful! 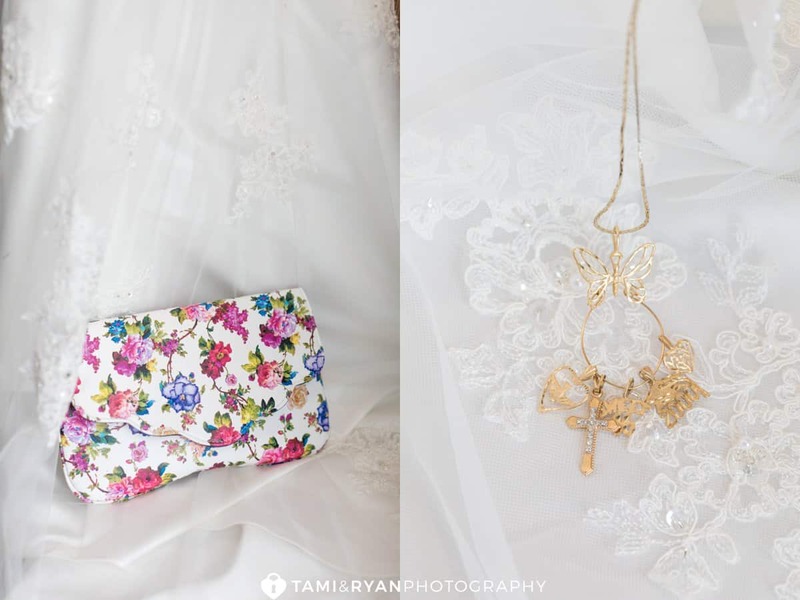 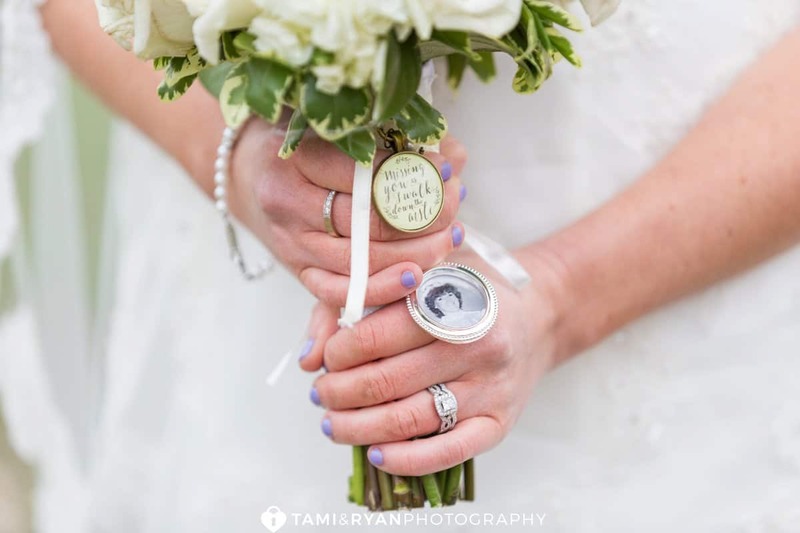 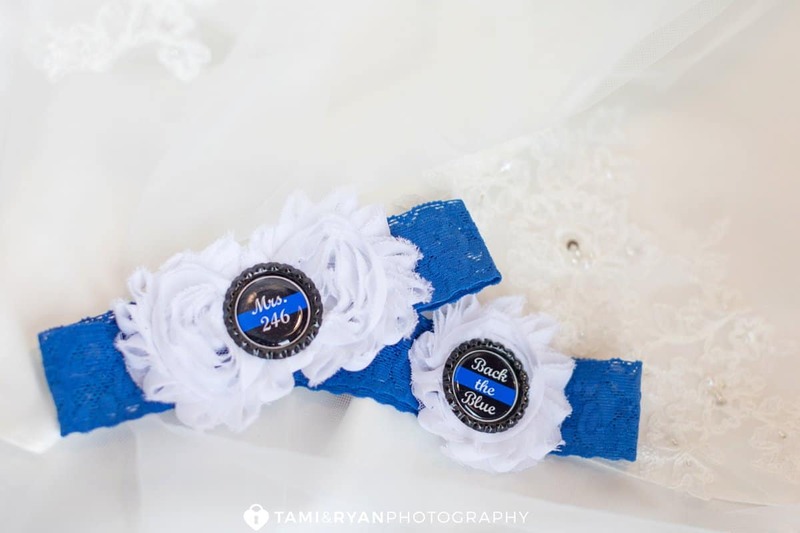 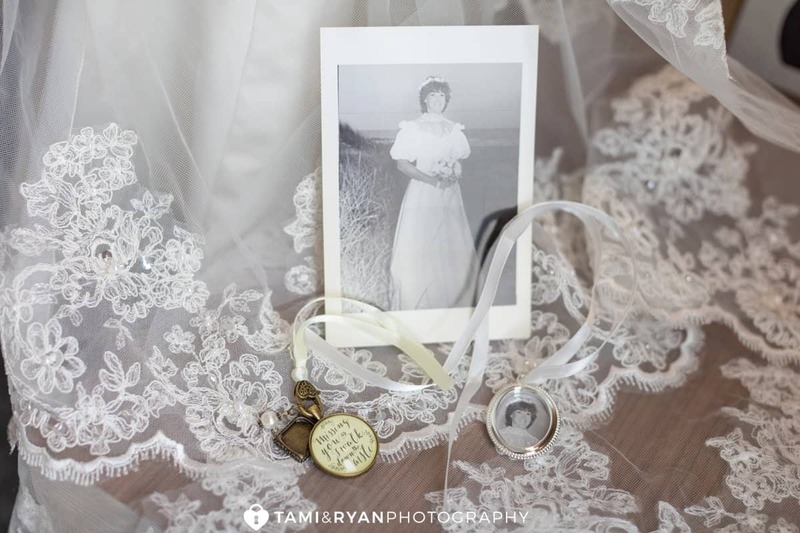 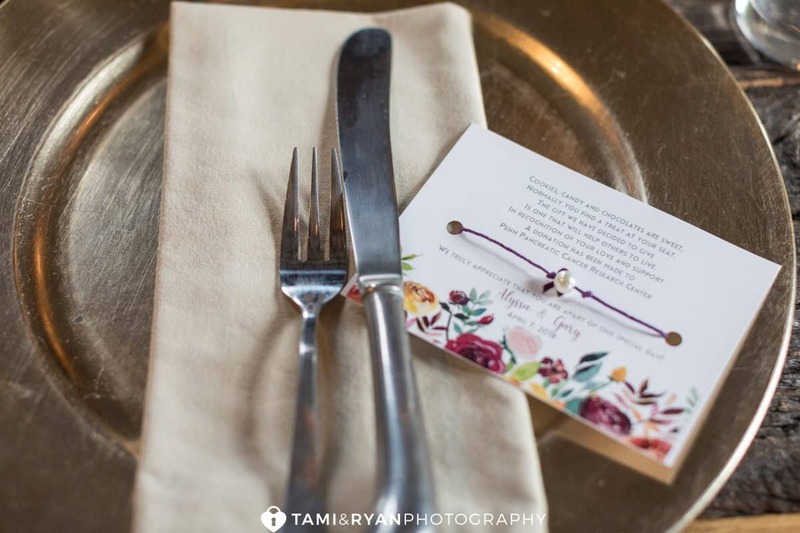 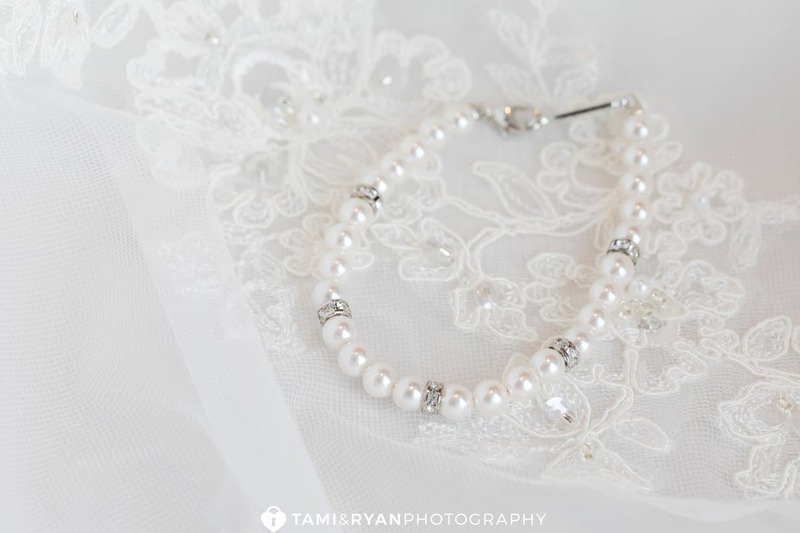 She also had two charms made up in memory of her mom, who was definitely watching down on this amazing couple throughout their special day, and always. 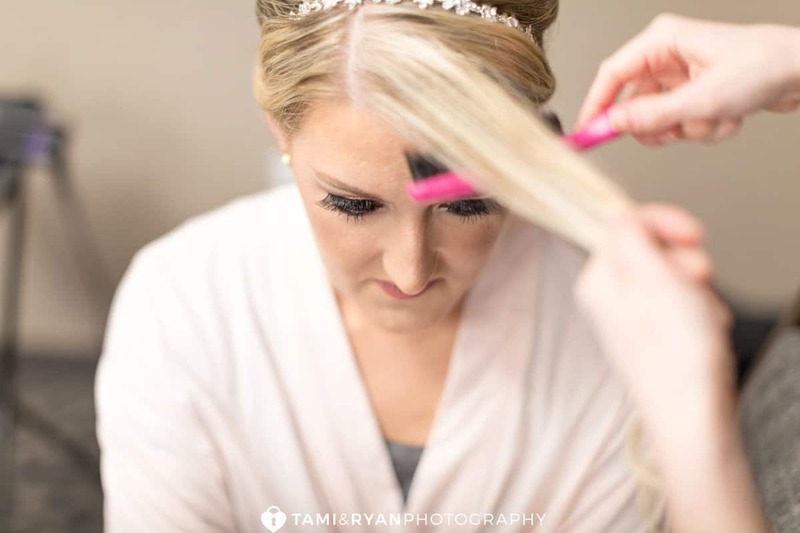 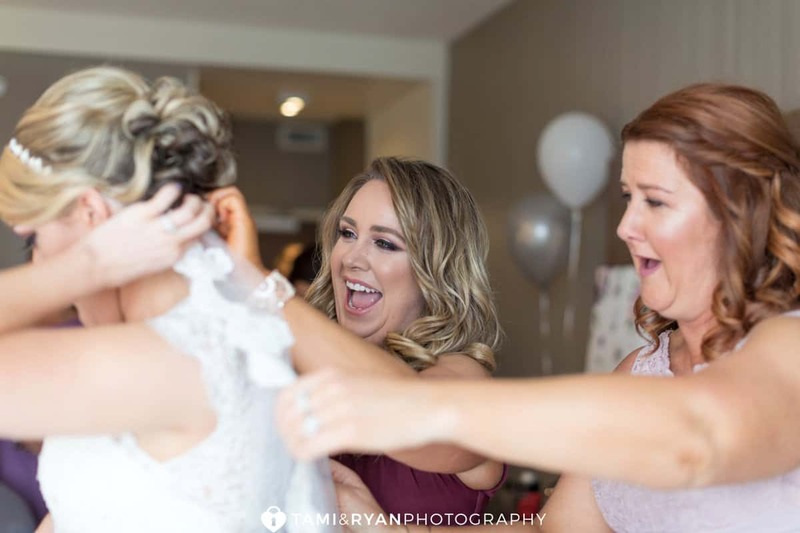 Alyssa and her bridesmaids got their hair and makeup done in The Garden Room at The Courtyard by Marriott. 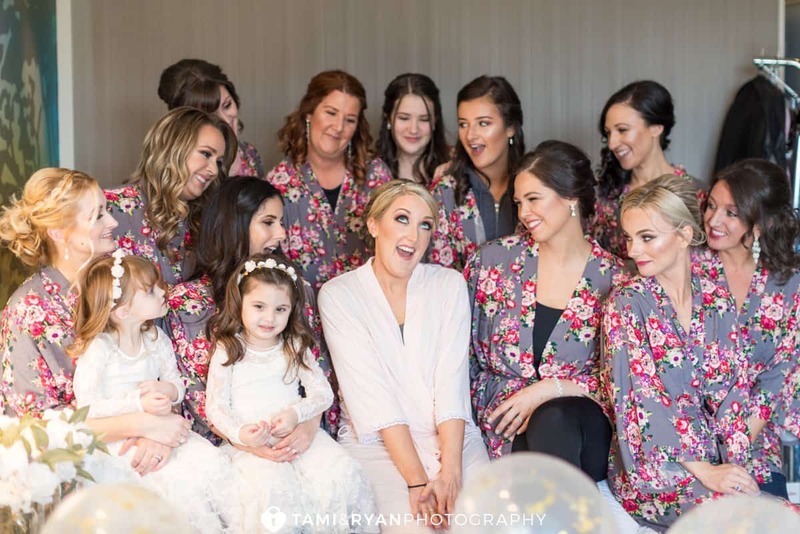 There was a lot of room for the girls to hang out, enjoy each others company and relax before the festivities of the day began! 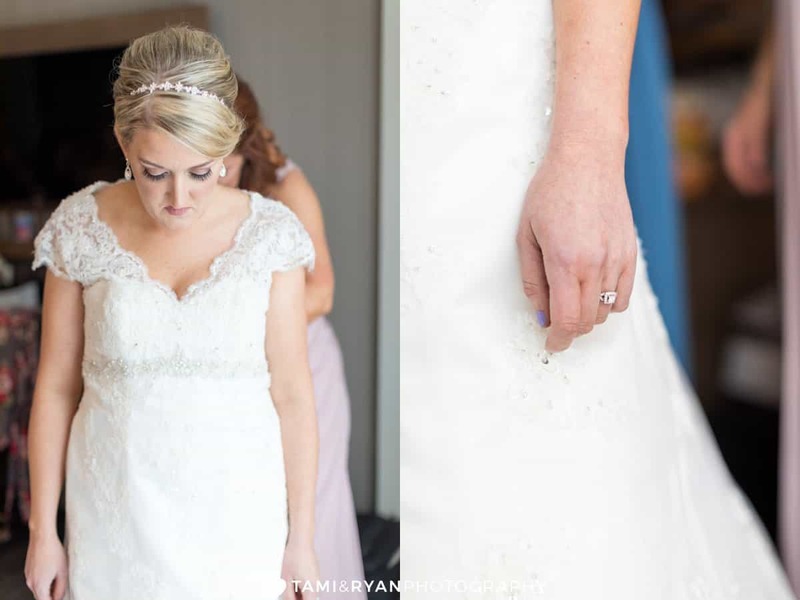 They proceeded to Alyssa’s room, where her sister, Jennifer helped her get in her wedding dress. 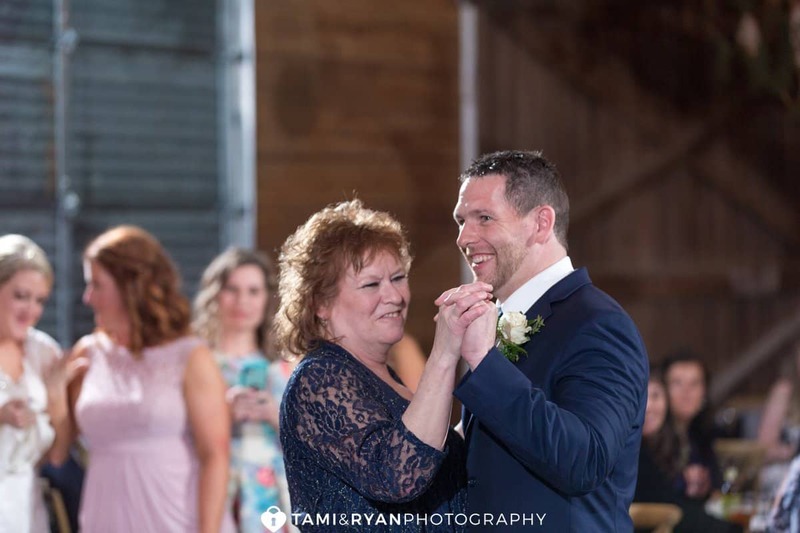 It was such a sweet, sentimental moment. 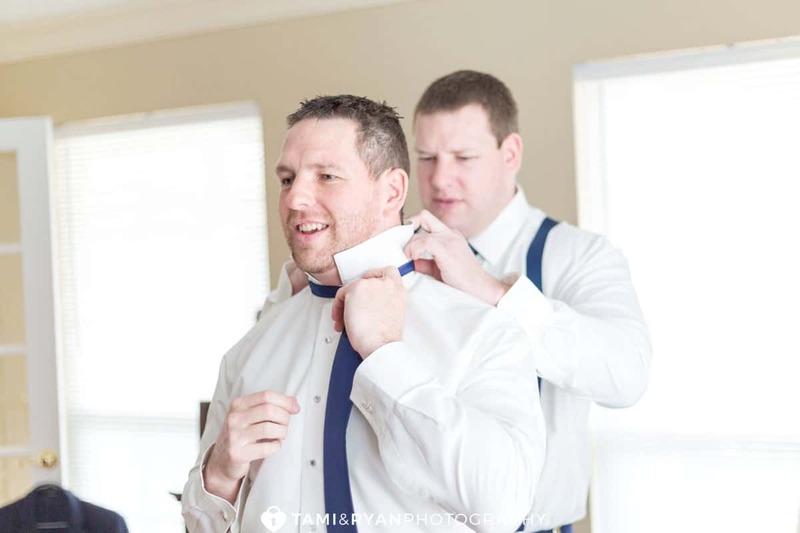 Meanwhile, Gary and his groomsmen were relaxing at the house that him and Alyssa bought together. 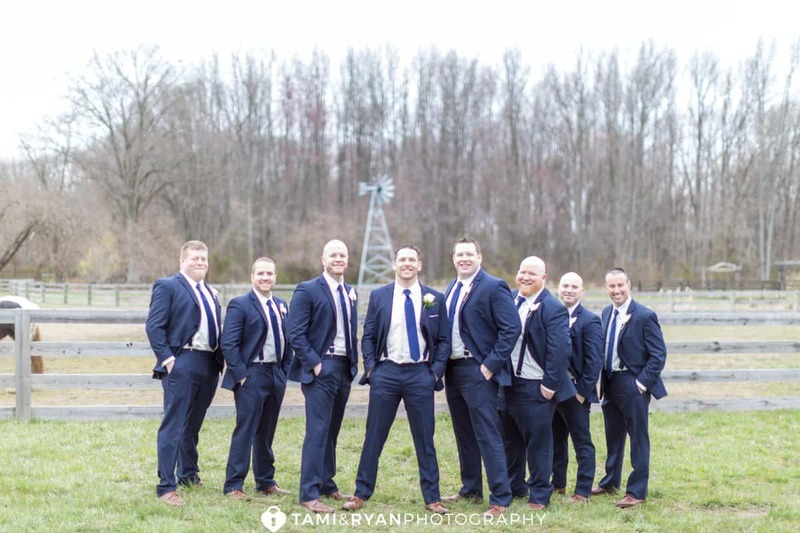 Its amazing the long years of friendship that Gary has with each of these important guys in his life. 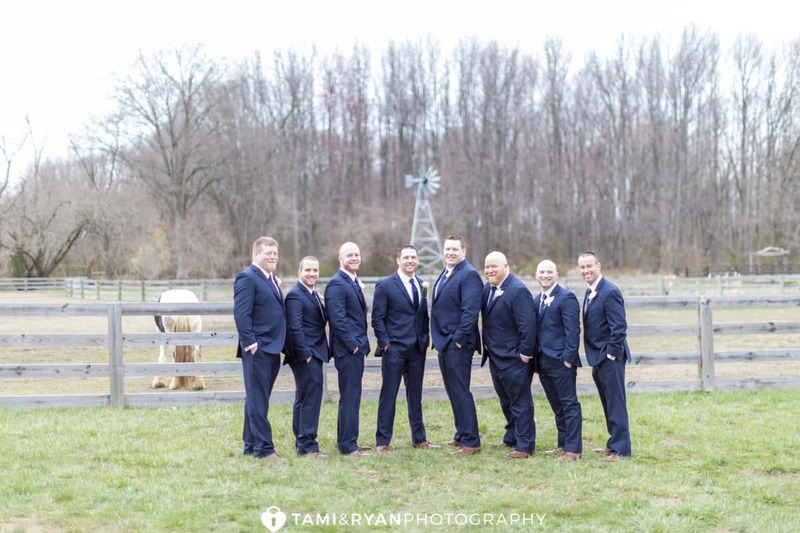 They all looked very dapper in their suits from Chadmoor Formal Wear. 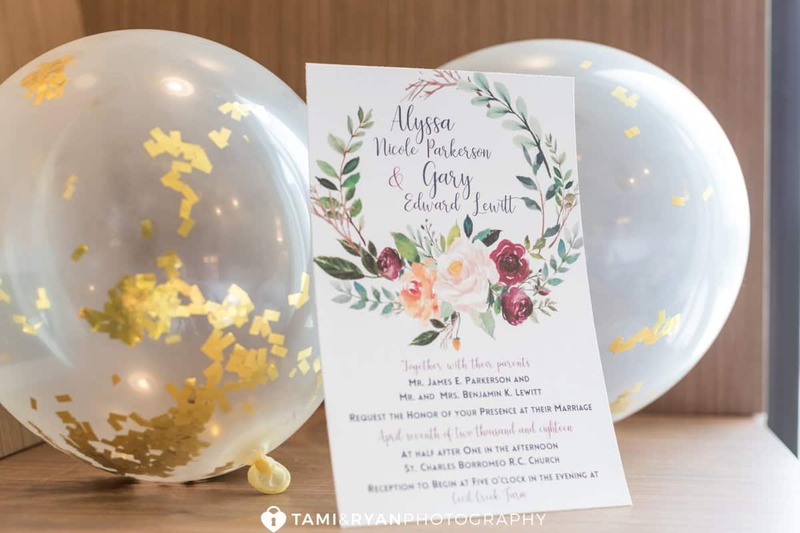 Alyssa’s birthday is one day before Christmas Eve. 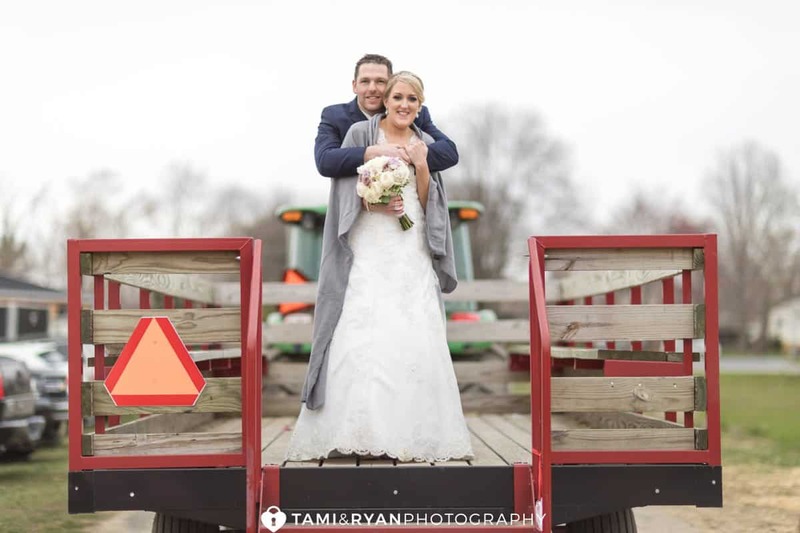 Unfortunately, she had to work, but she lucked out! 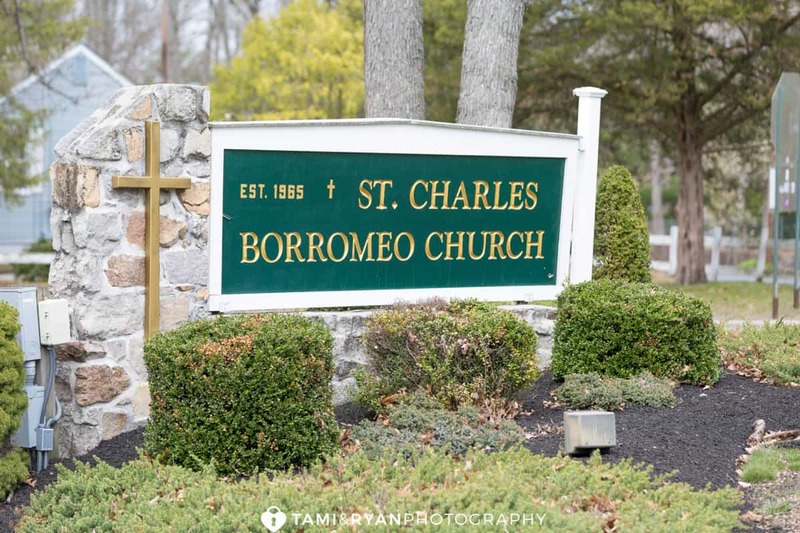 They weren’t busy, so they decided to close early. 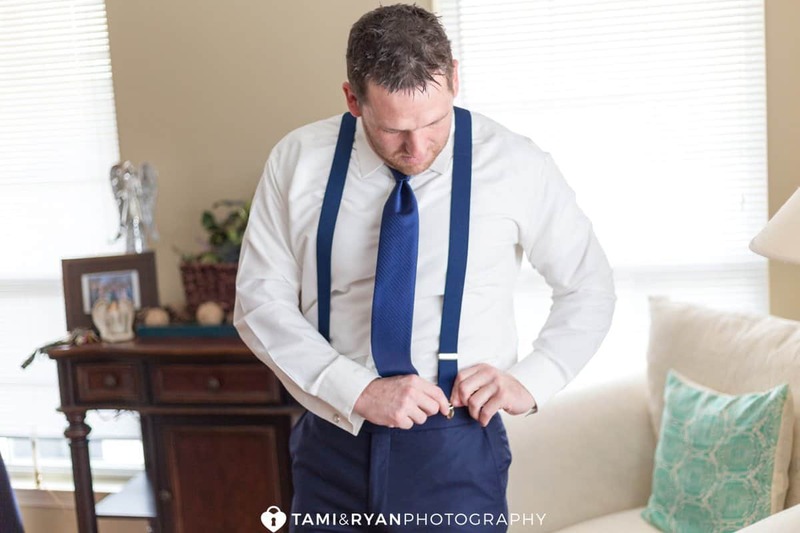 Alyssa pushed up the time she was going meet with her coworkers, but when she arrived home, Gary had different plans. 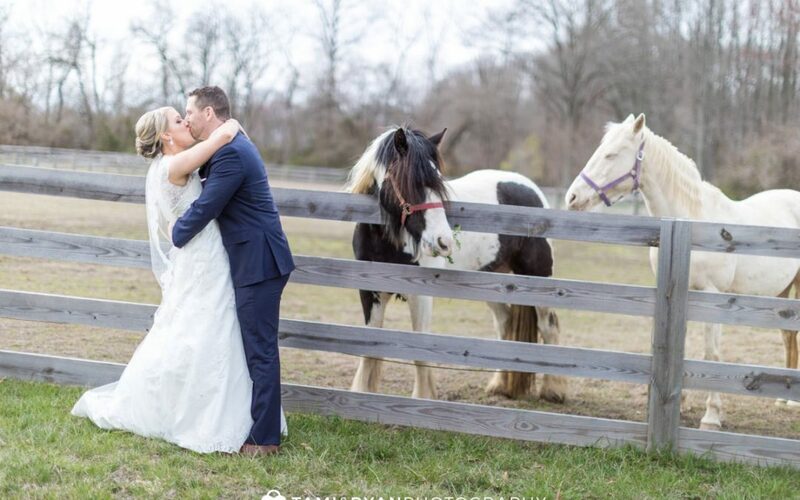 He invited her family and his parents over! 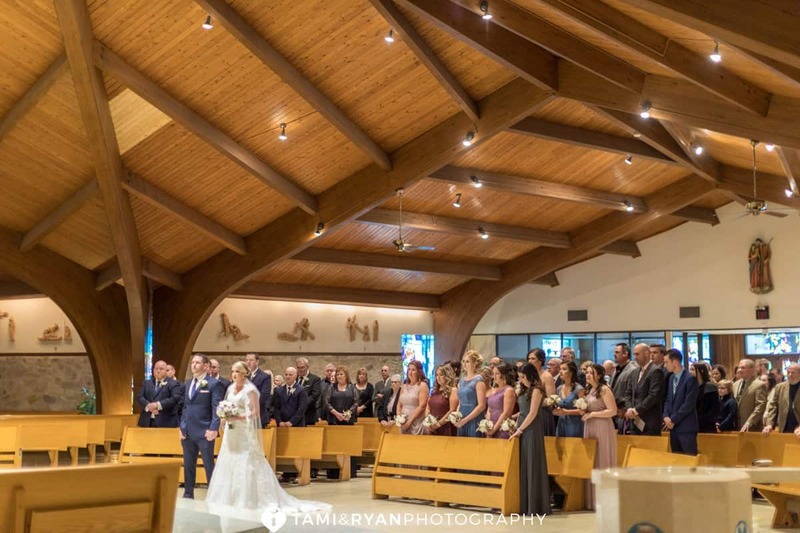 As everyone was arriving, Alyssa was excited because she was thinking how thoughtful it was to have everyone over. 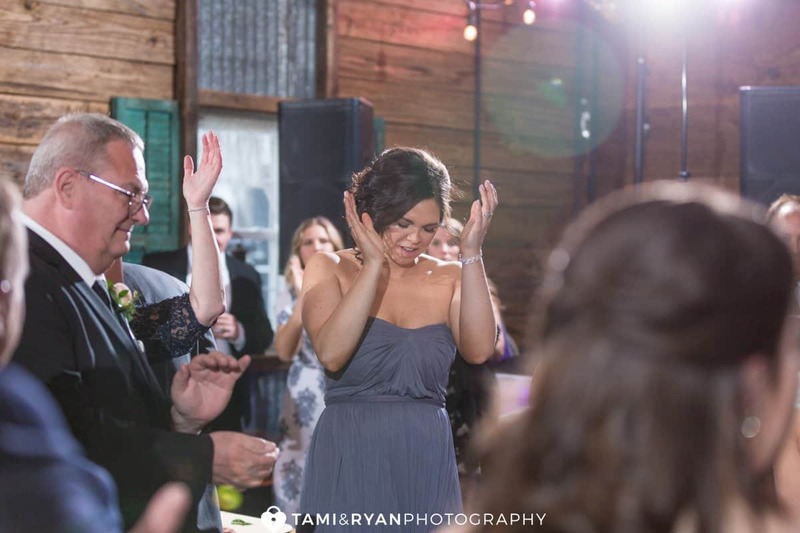 Alyssa really didn’t think anything of it, just that she felt so loved and blessed. 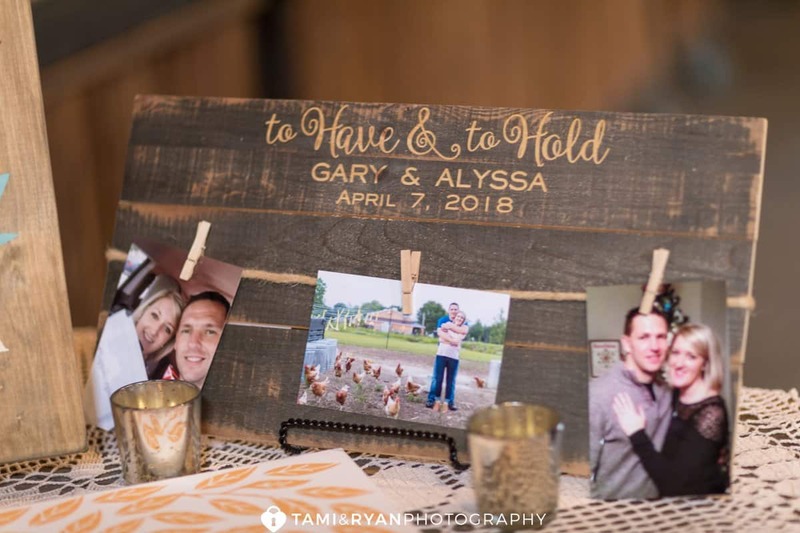 Alyssa thought Gary was helping to make her day, because she was sad it was another birthday that she was not celebrating with her mother. 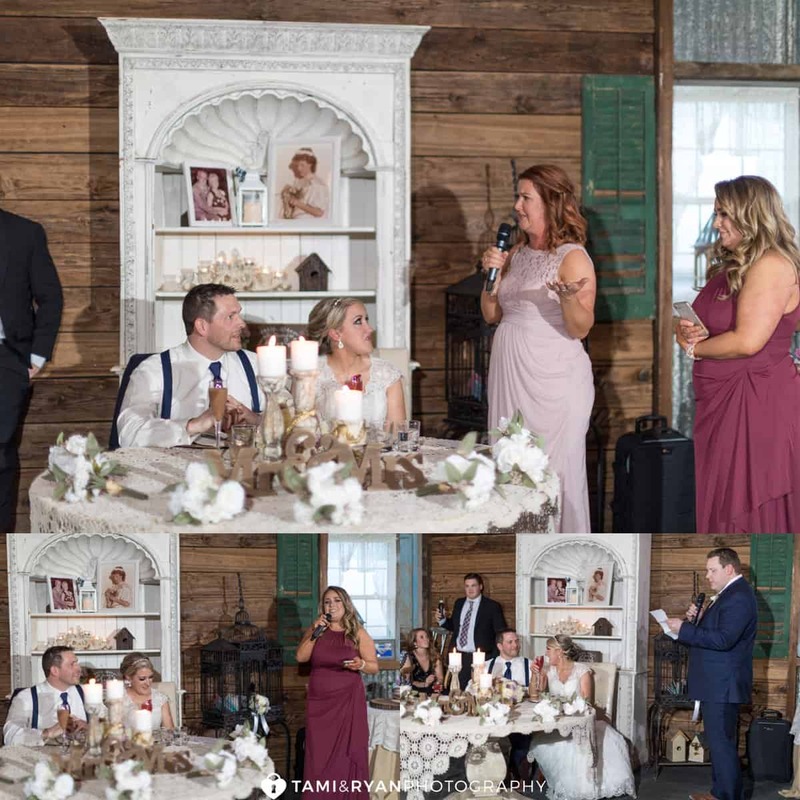 After a little while, Gary’s brother arrived because he claimed he wanted cake, and so they sang to her. 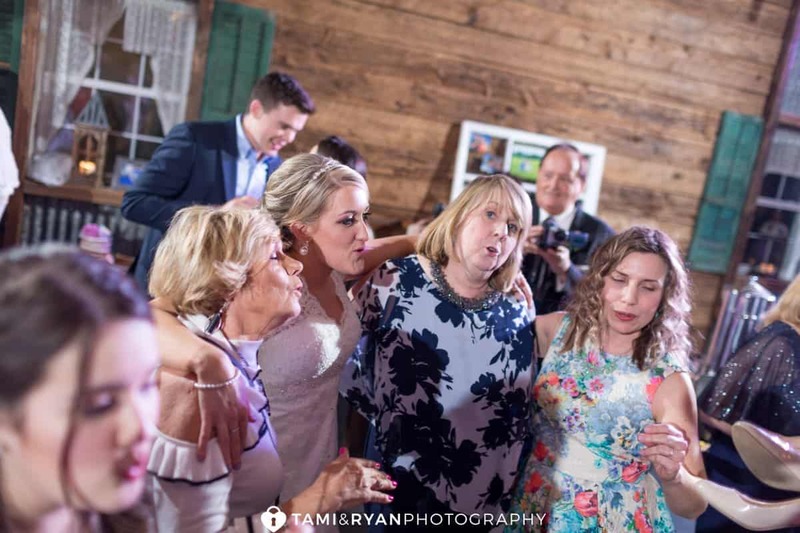 After Alyssa blew out the candles, everyone was still standing with their cameras in front of their faces. 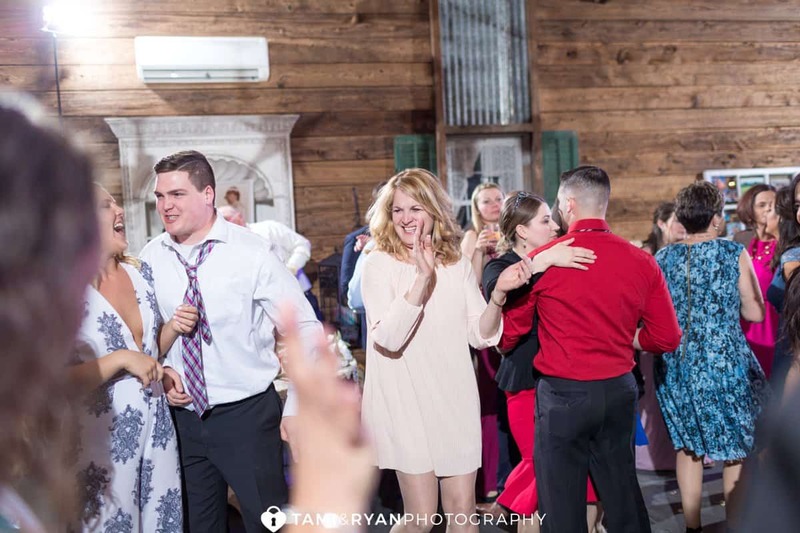 Alyssa looked confused and asked what was going on. 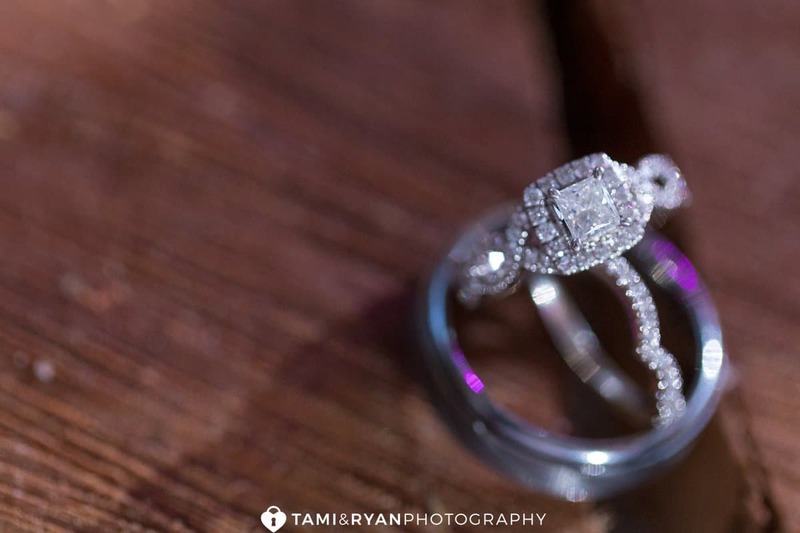 As she turned to her right, there was Gary smiling down on one knee with an amazing wedding ring in a box. 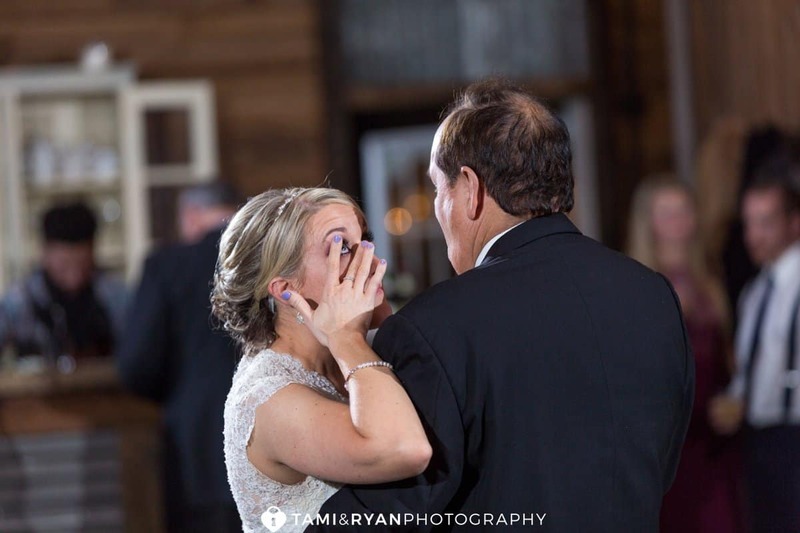 Alyssa broke down sobbing because she couldn’t believe he had FINALLY asked her. 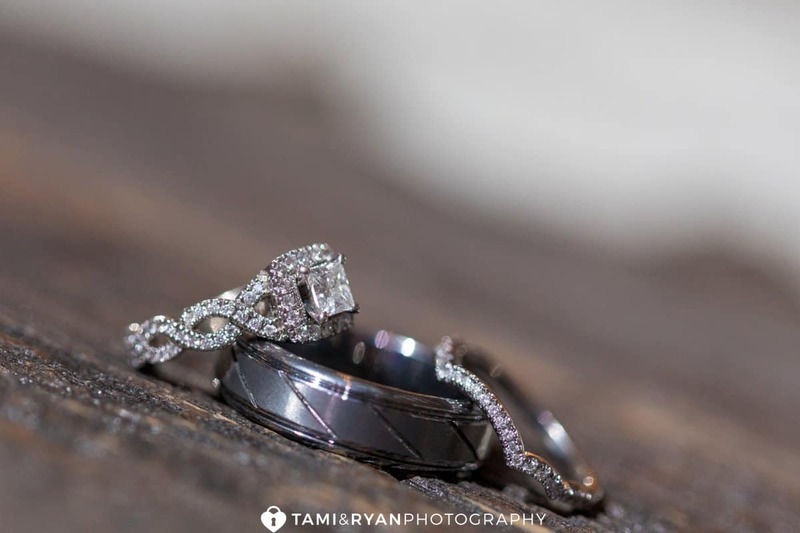 It was an amazing birthday to say the least!! 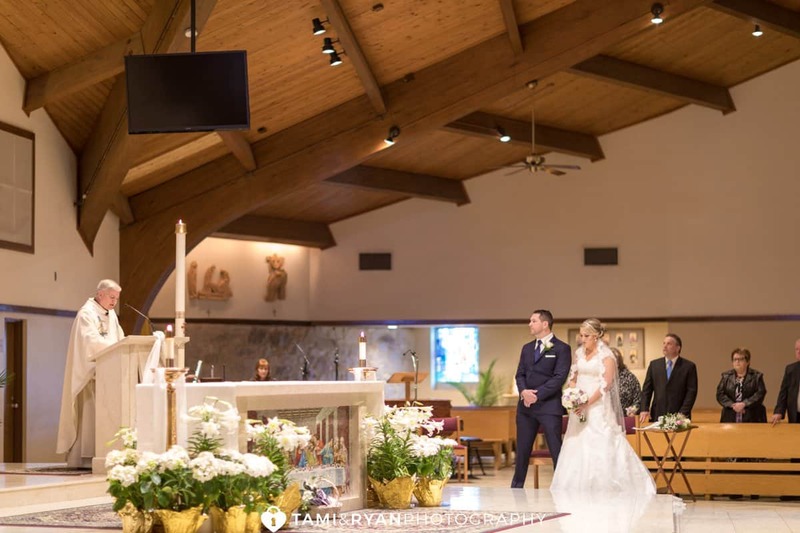 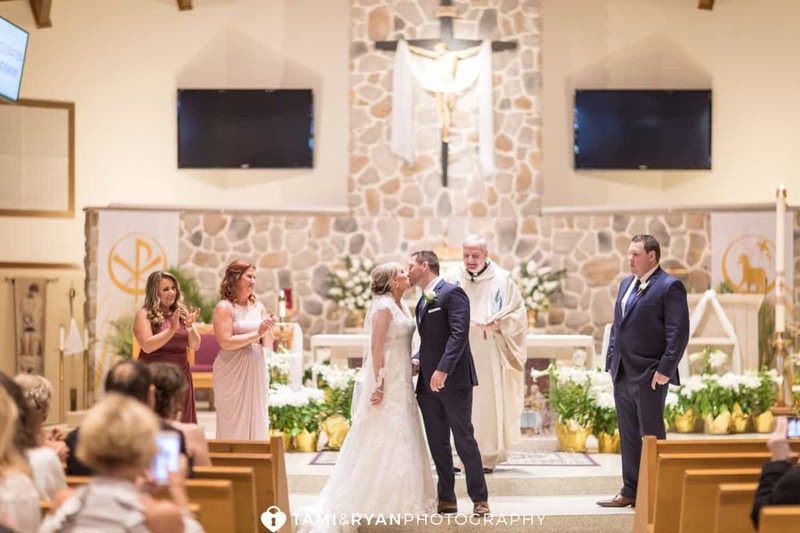 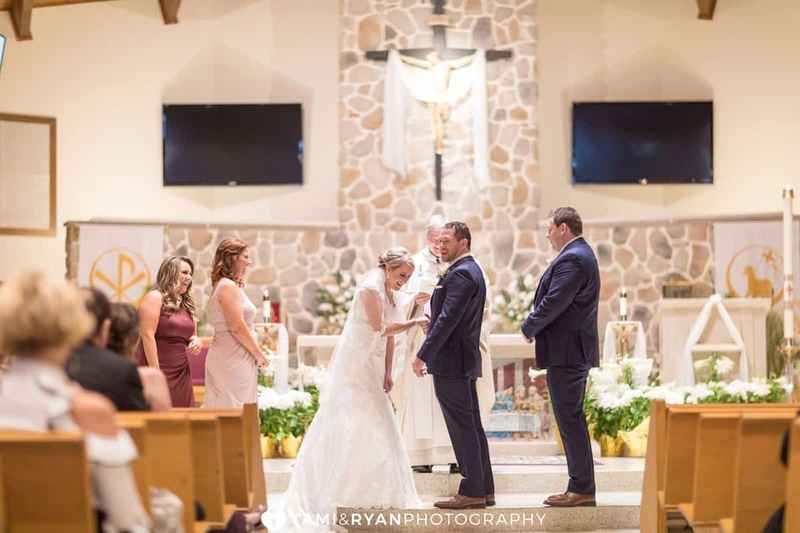 Alyssa and Gary said their I Do’s in the church that Alyssa grew up going to. 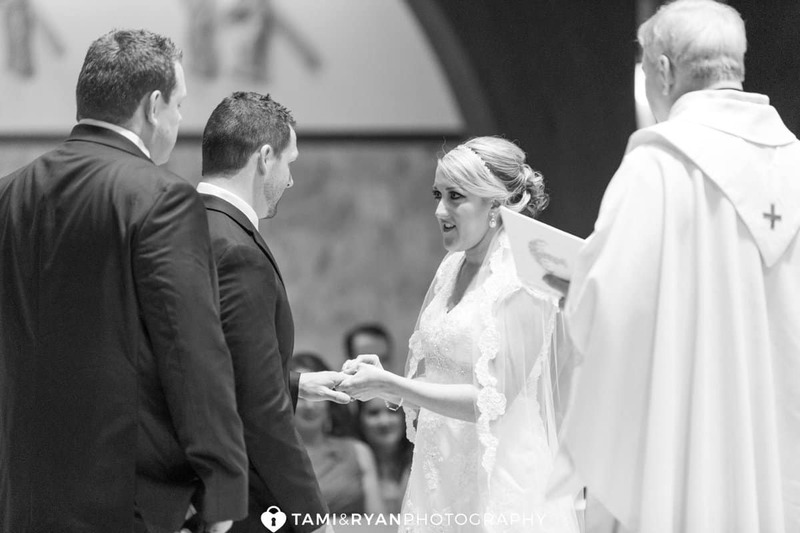 Father Michael Matveenko performed a beautiful, sentimental ceremony. 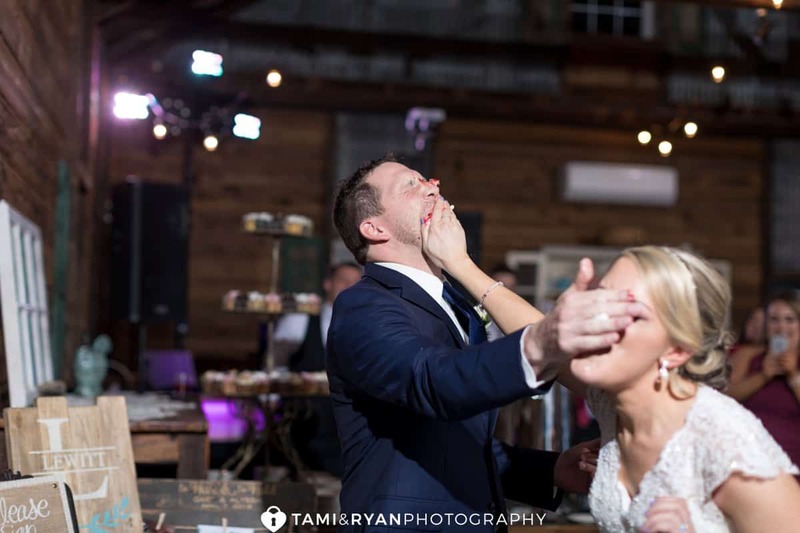 Gary had clearly been anticipating this moment. 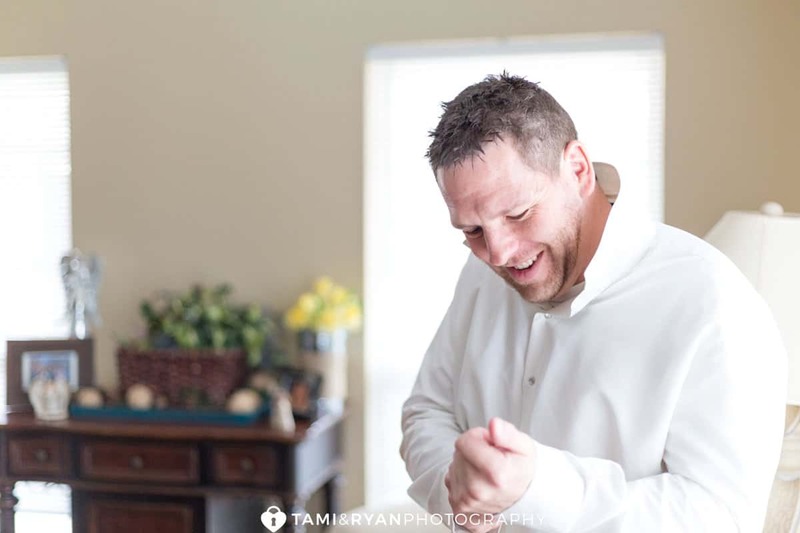 The moment he saw his bride for the very first time. 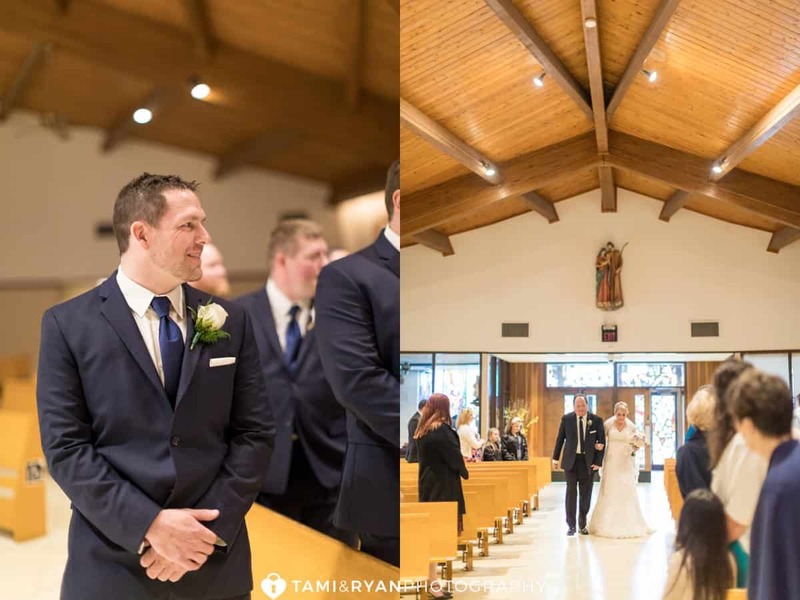 You could feel the anticipation from him and Alyssa, and there was nothing but joy beaming from them both. 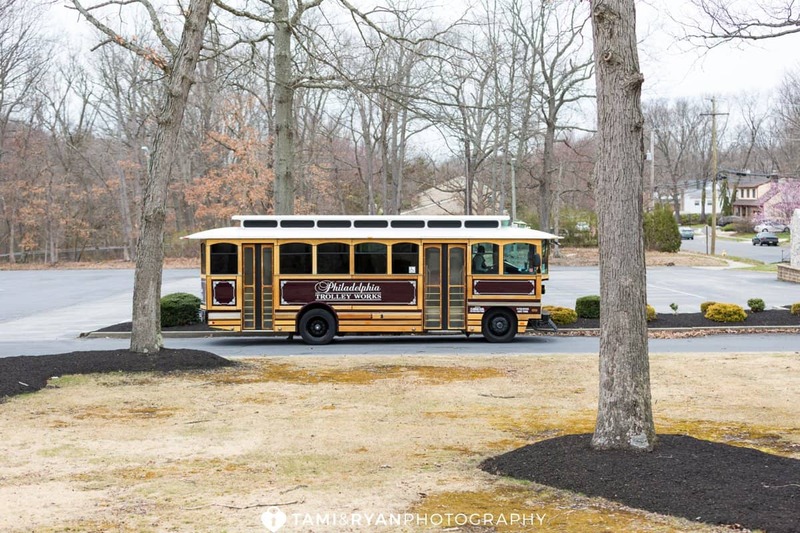 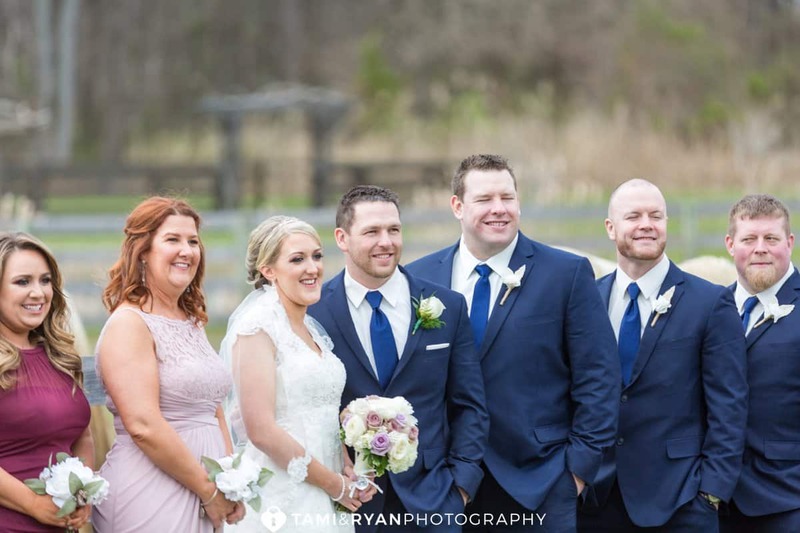 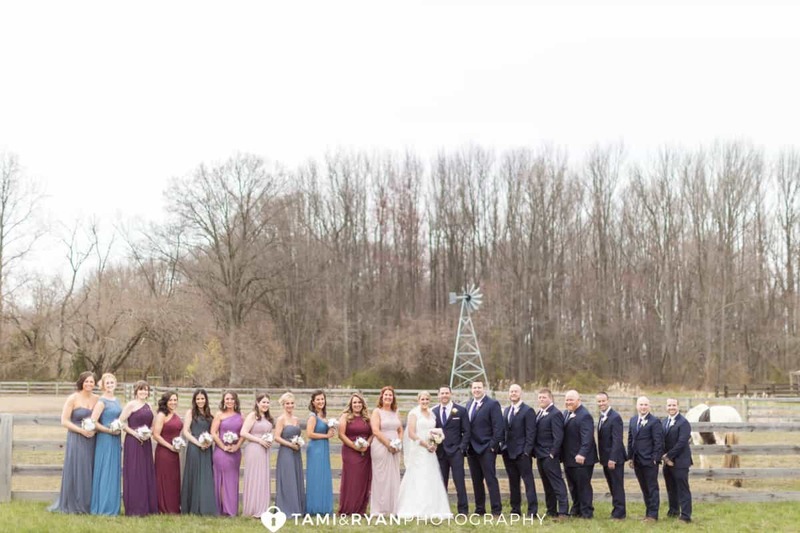 Cecil Creek Farm has no shortage of locations for Bridal Party photos. 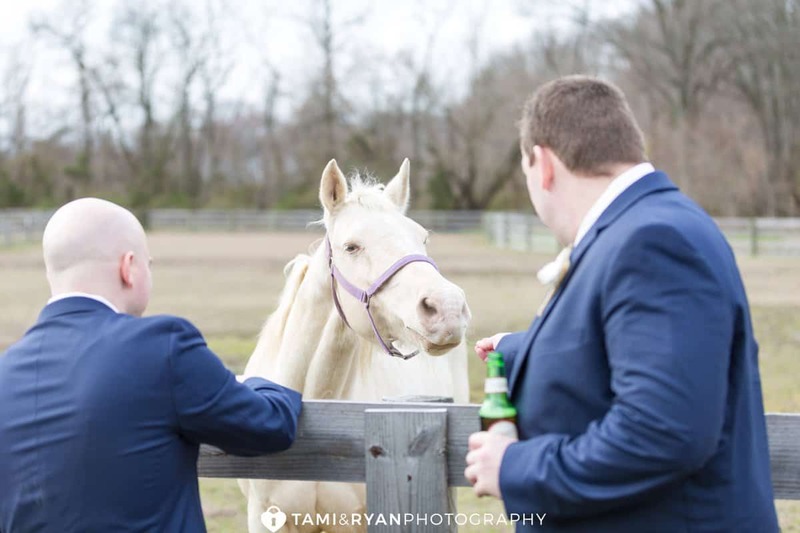 We took the tractor to the back of the Farm, where we were greeted by their two horses, who absolutely loved being in the photos with everyone! 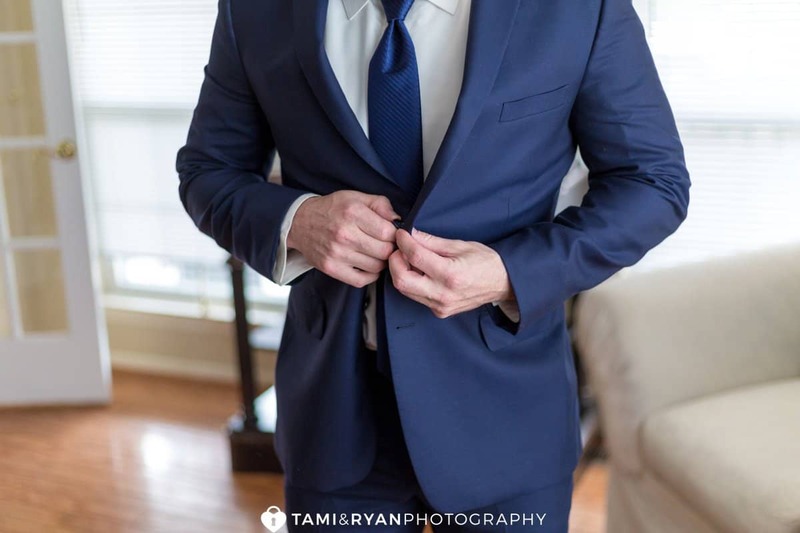 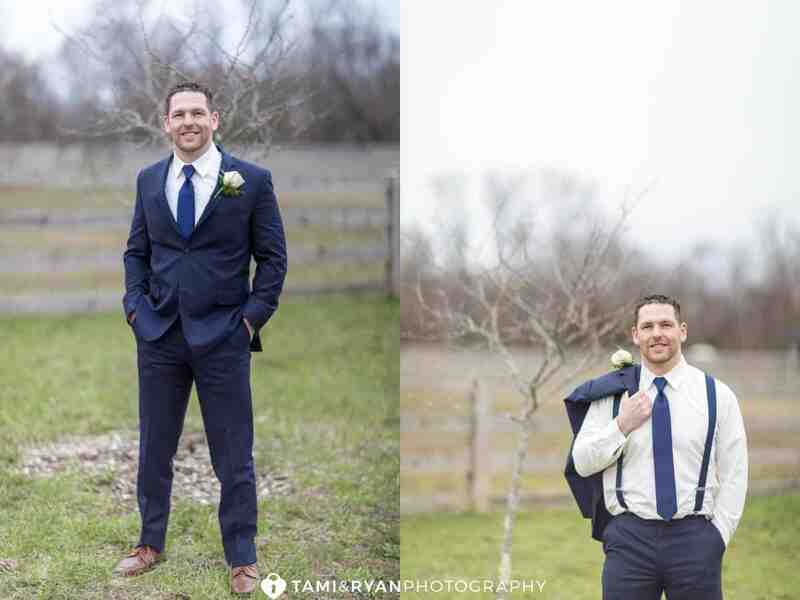 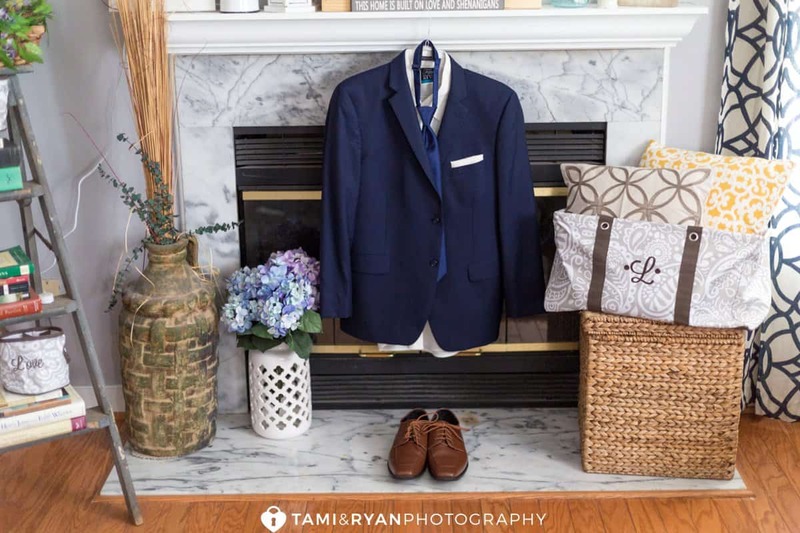 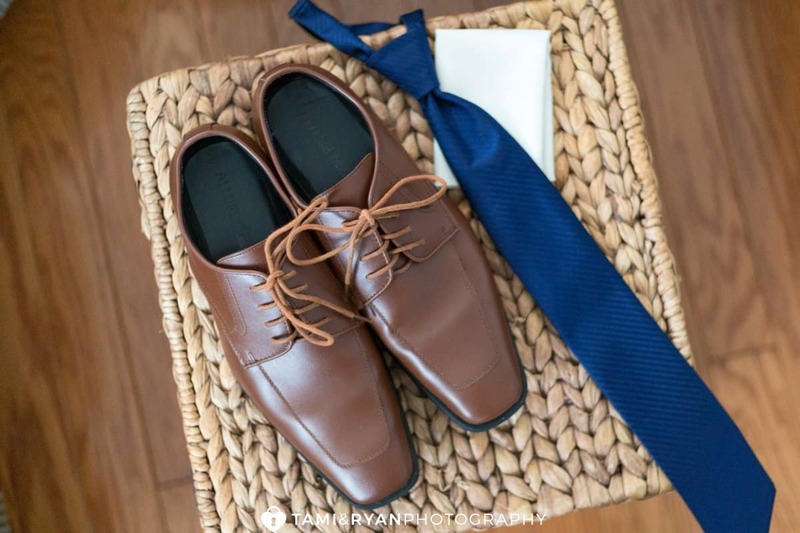 I absolutely adore the rustic, yet classic feel that the mis-matched bridesmaids dresses give next to the navy suits that each of the guys wore. 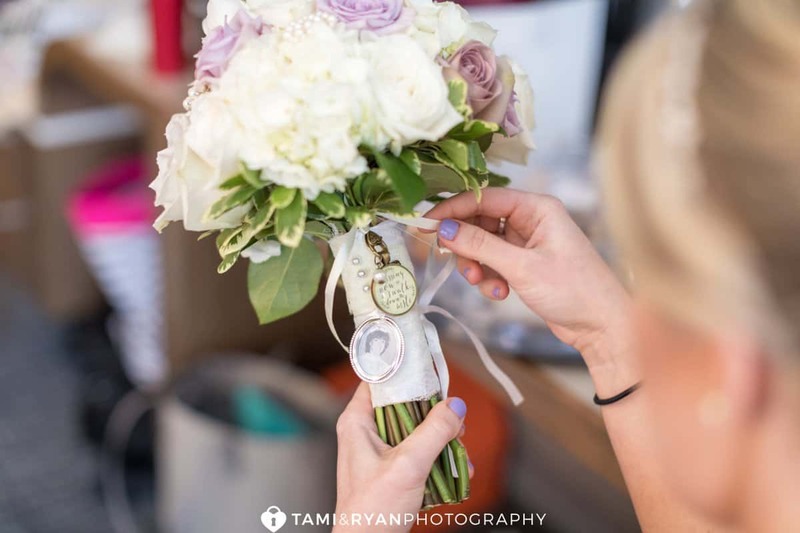 Plus, each of their bouquets, had simple little burlap touches, which was the perfect addition. 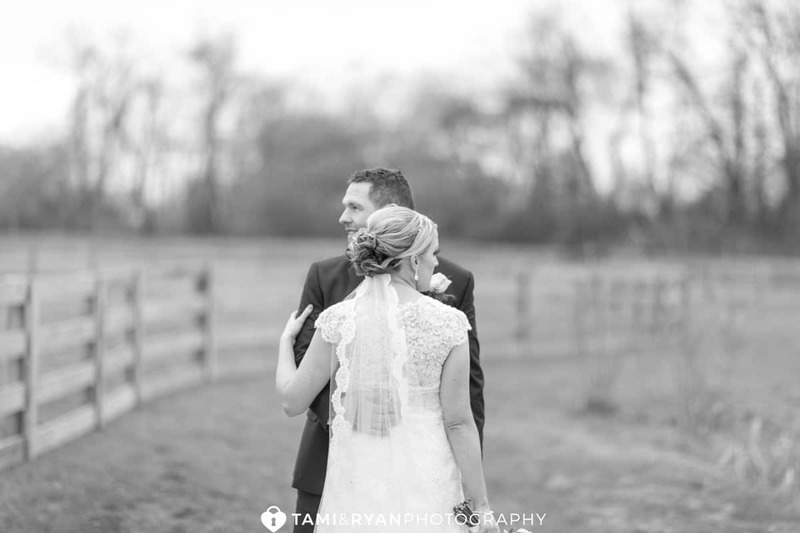 We could photograph Alyssa and Gary all day long. 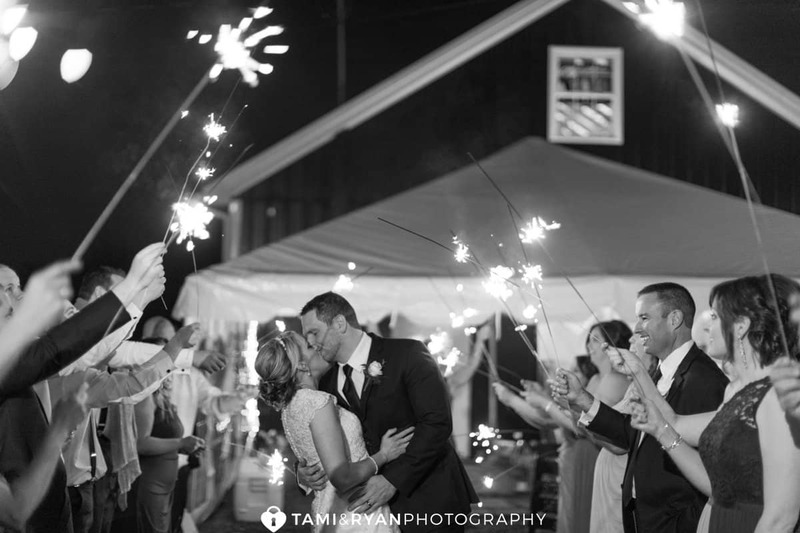 They are so comfortable and so in love with one another, which, in turn, results in such classic and romantic images. 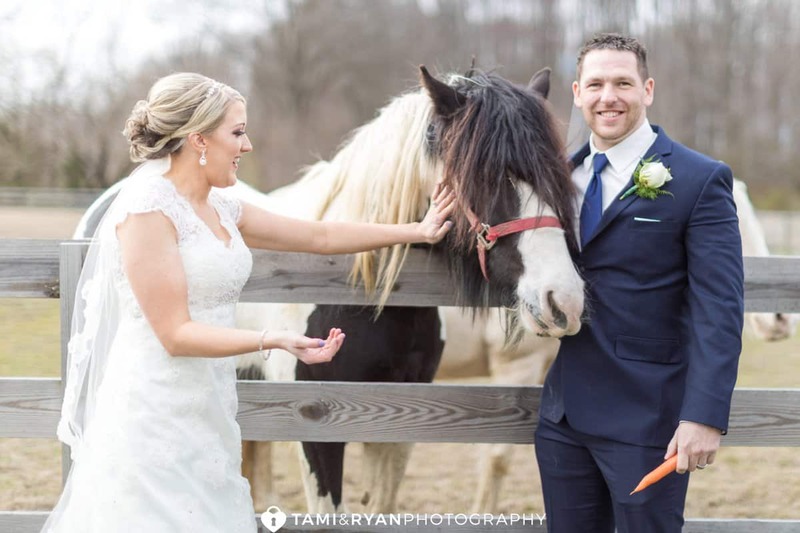 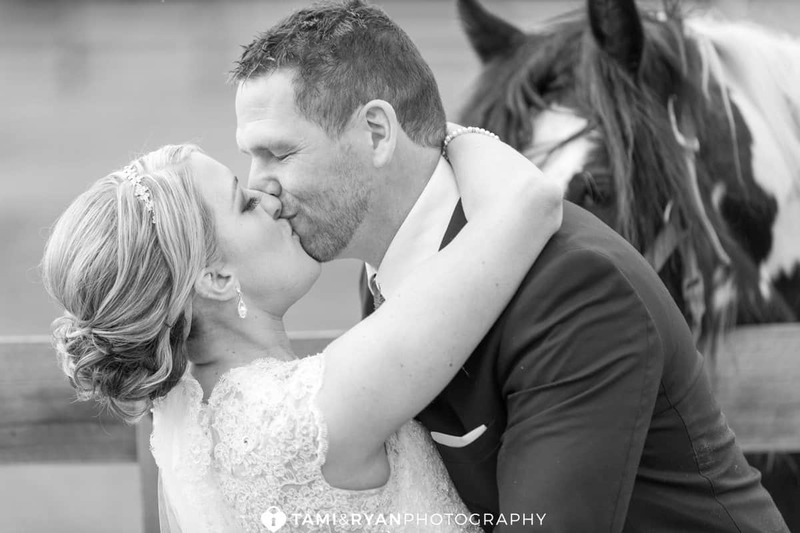 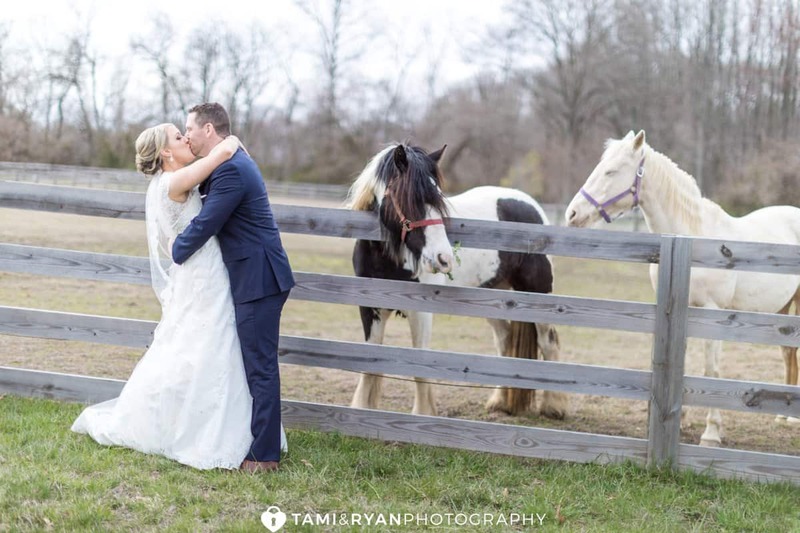 I think the horses loved this bride and groom as well, because they could not get enough of them! 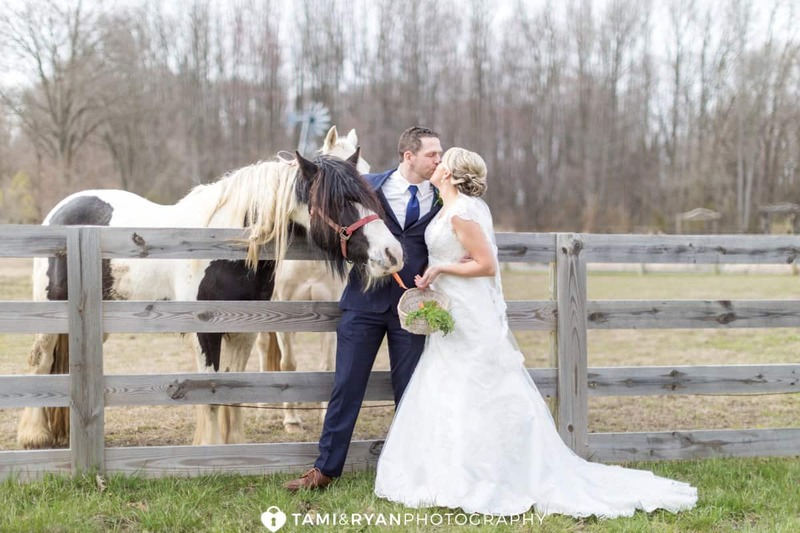 We took advantage of the friendly horses, the barn and the field, because you really can’t go wrong with any location you choose around Cecil Creek Farm. 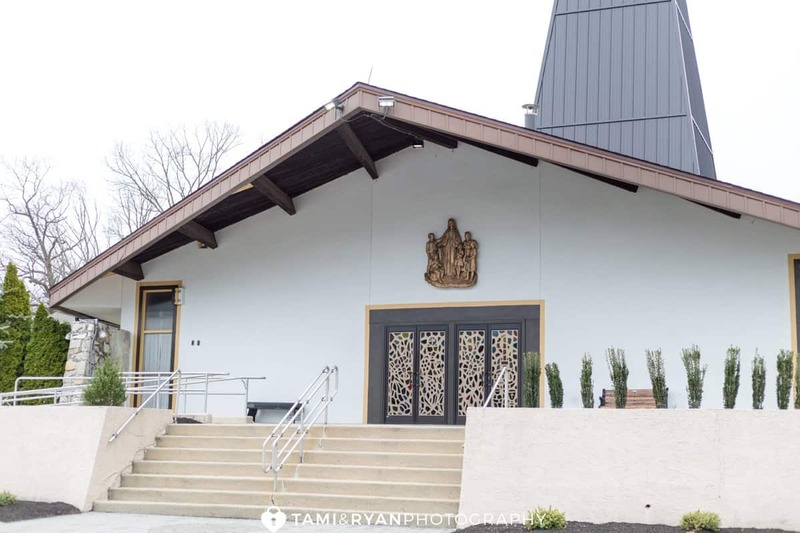 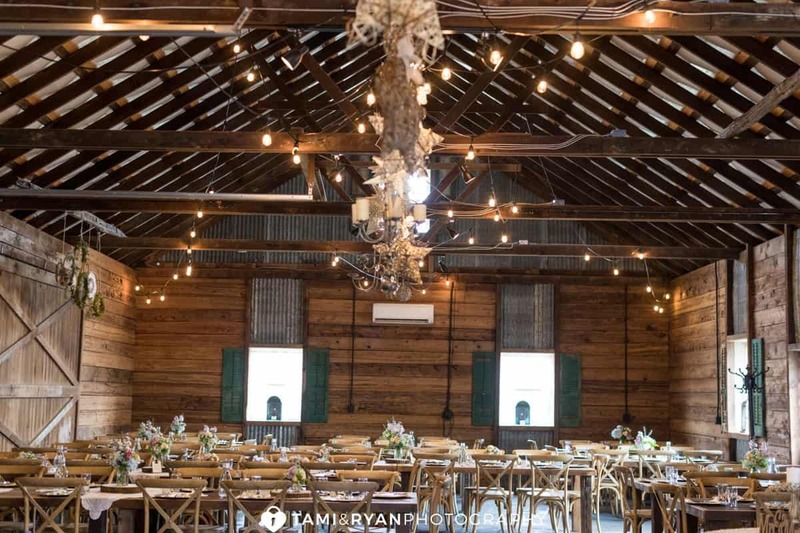 It might be our newest favorite venue! 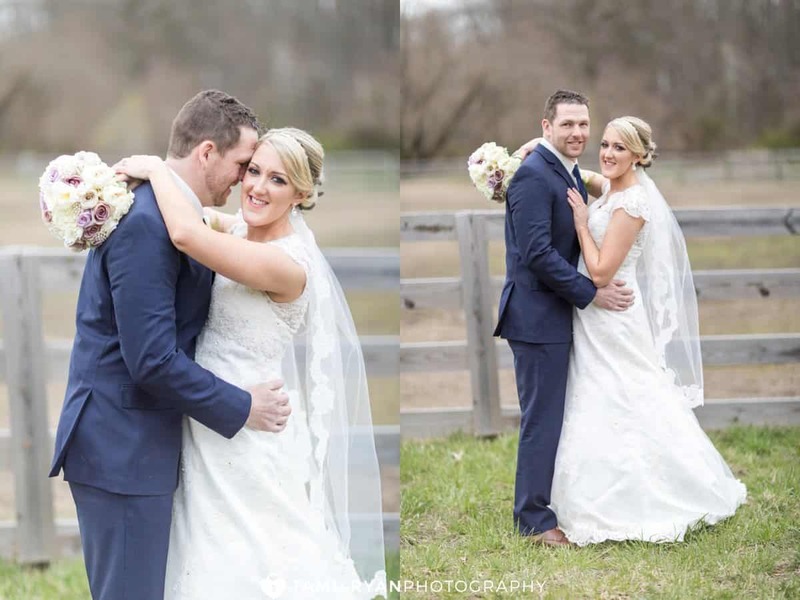 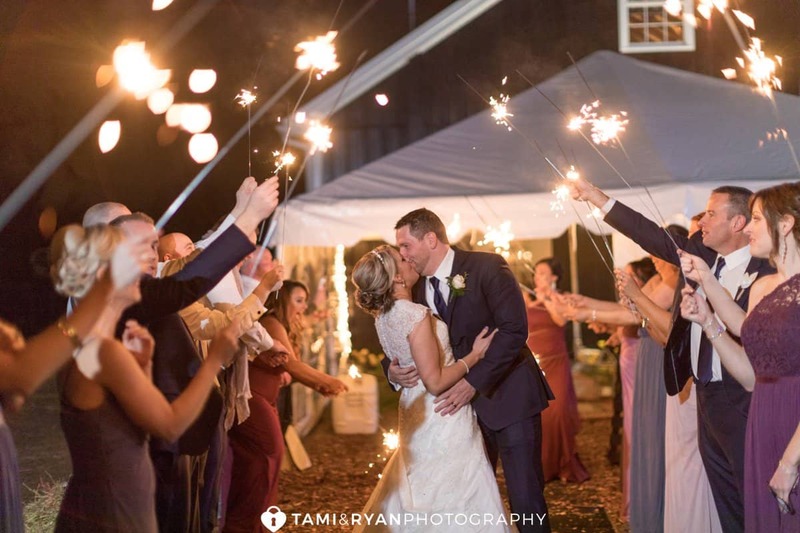 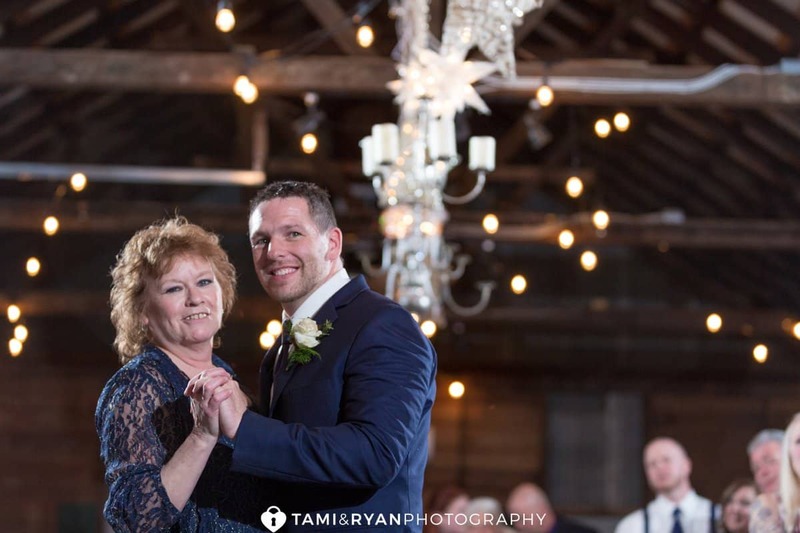 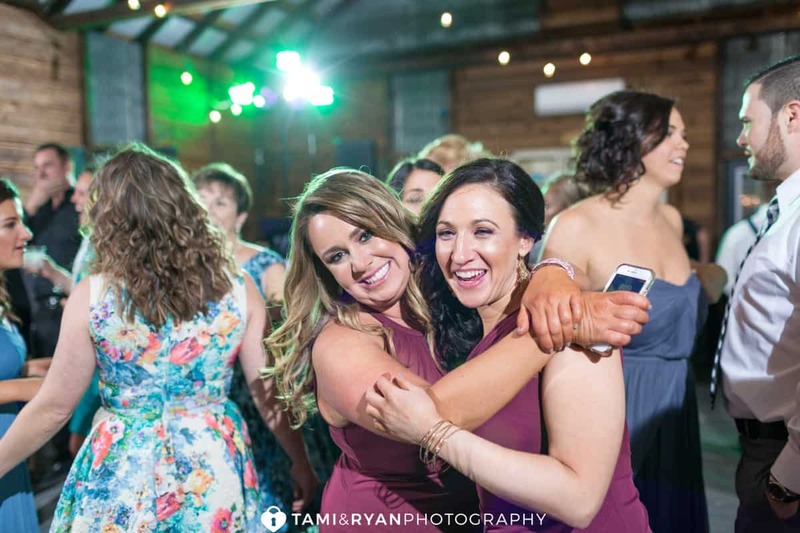 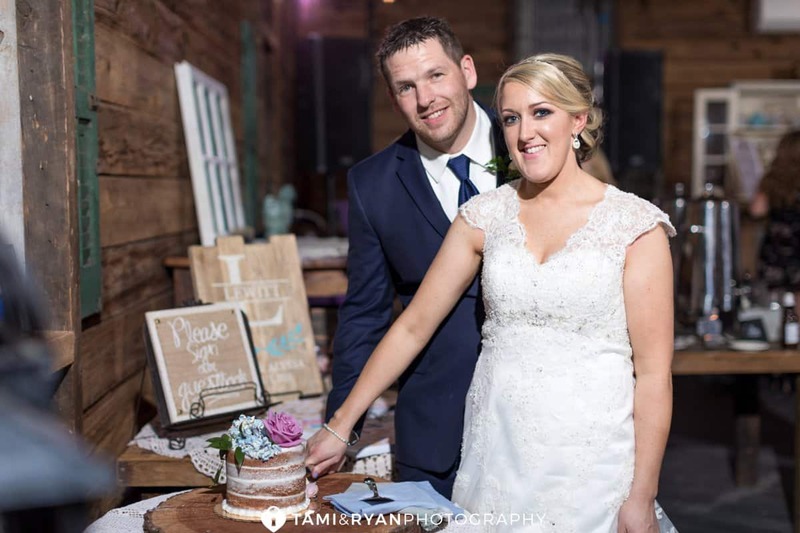 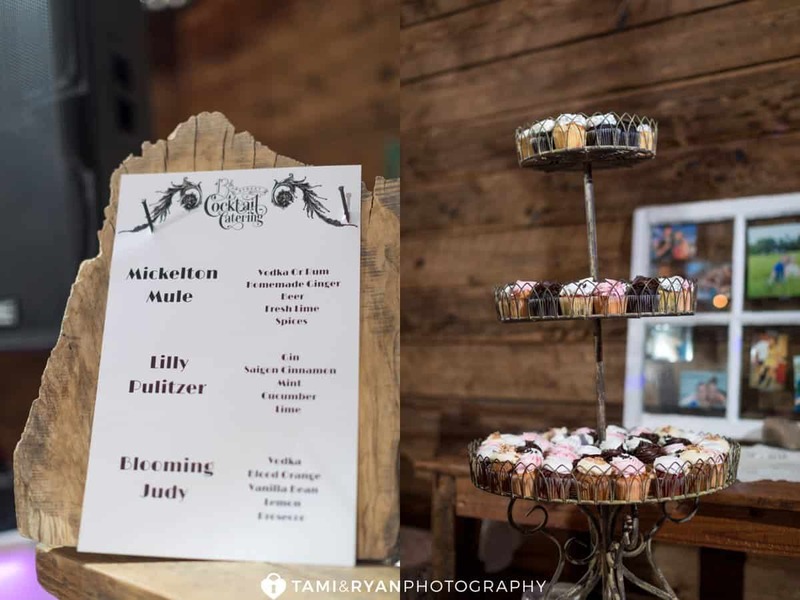 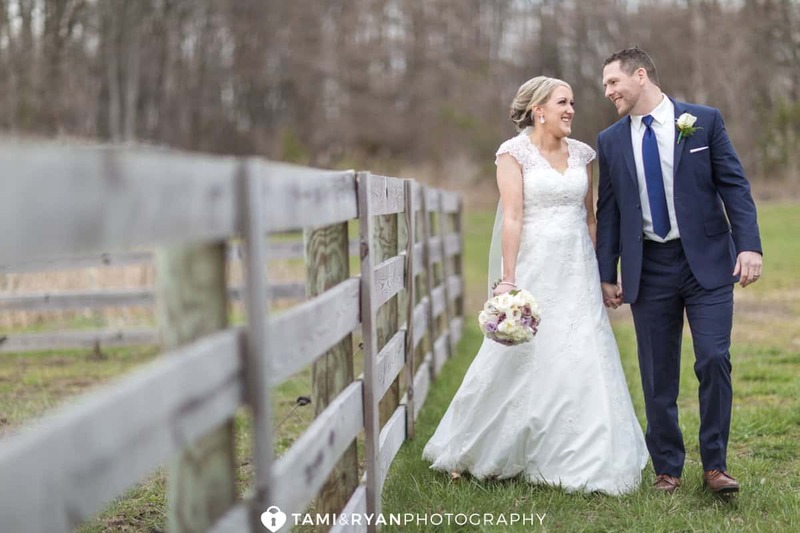 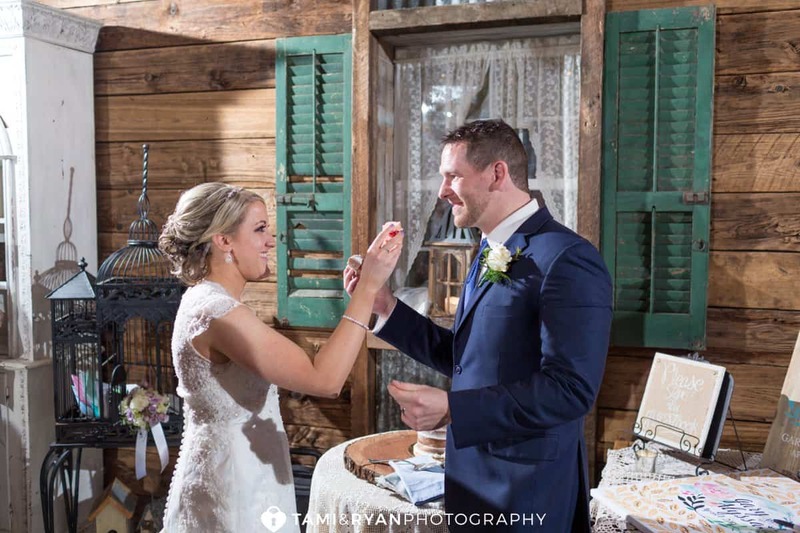 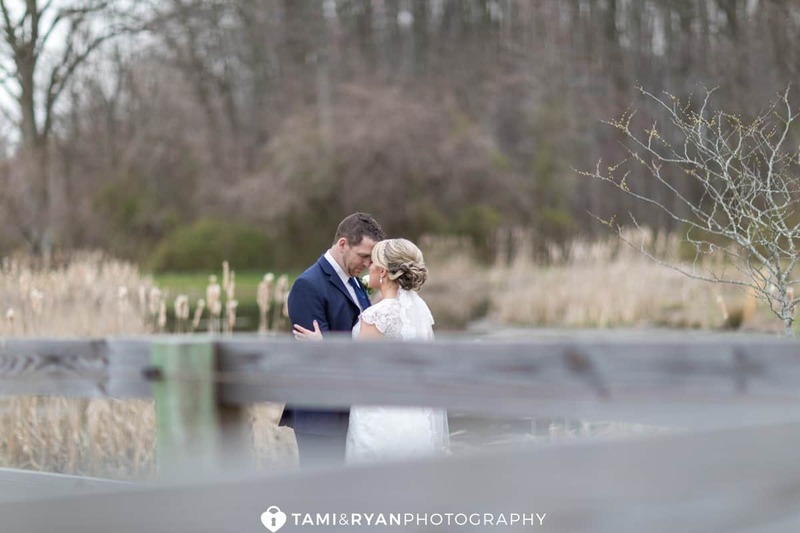 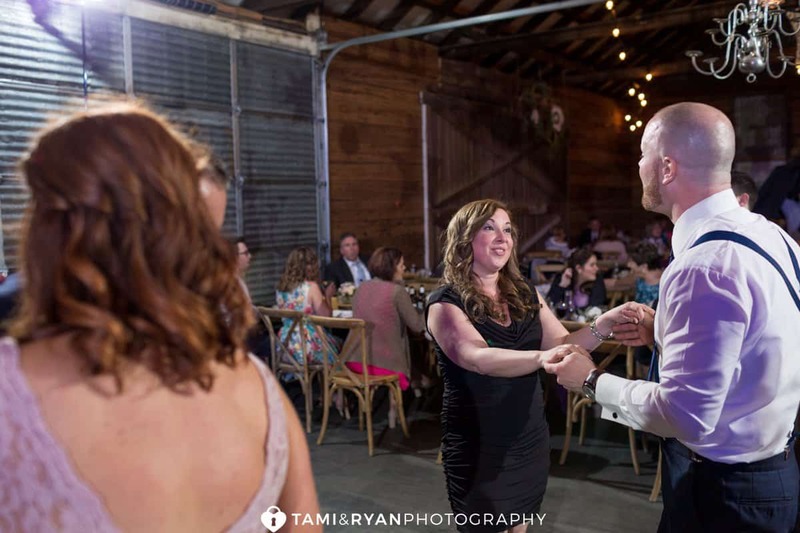 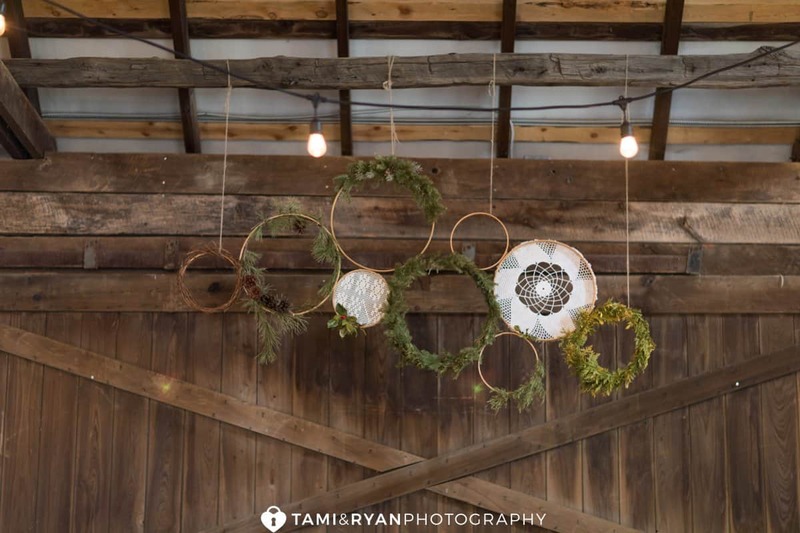 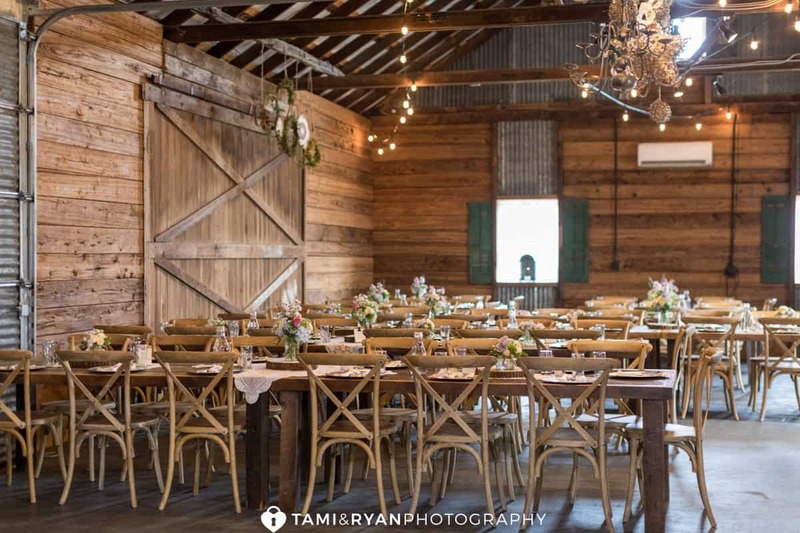 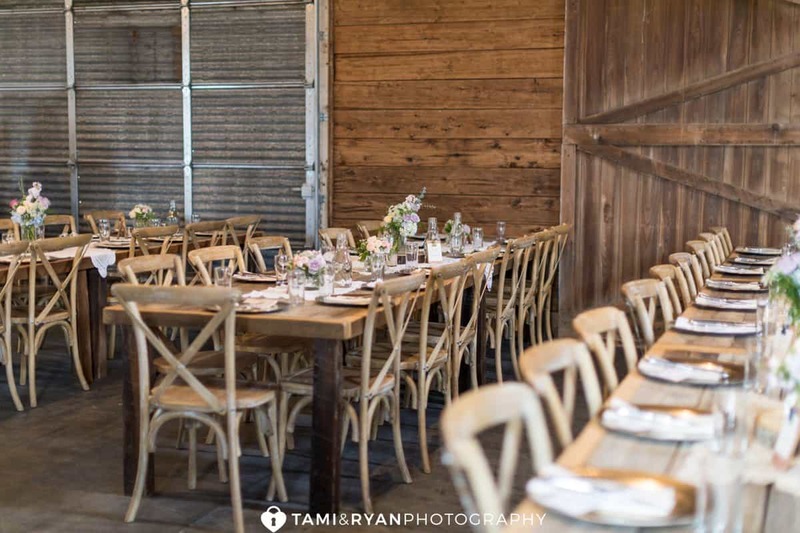 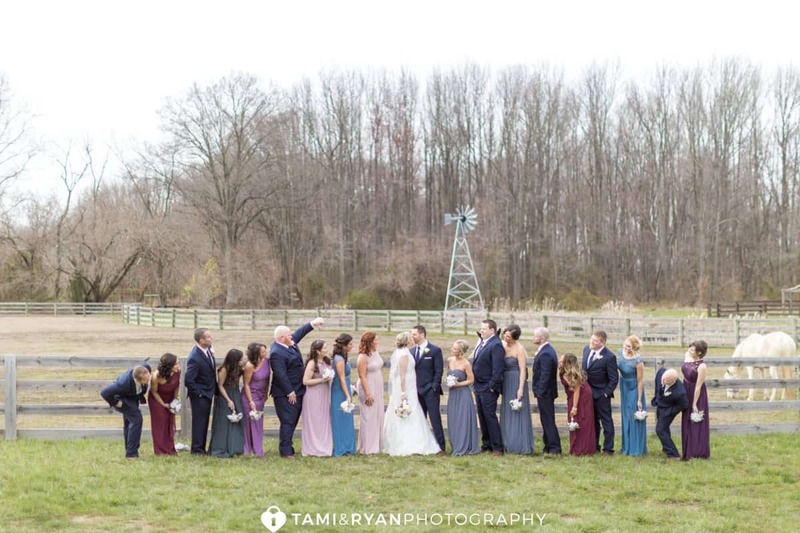 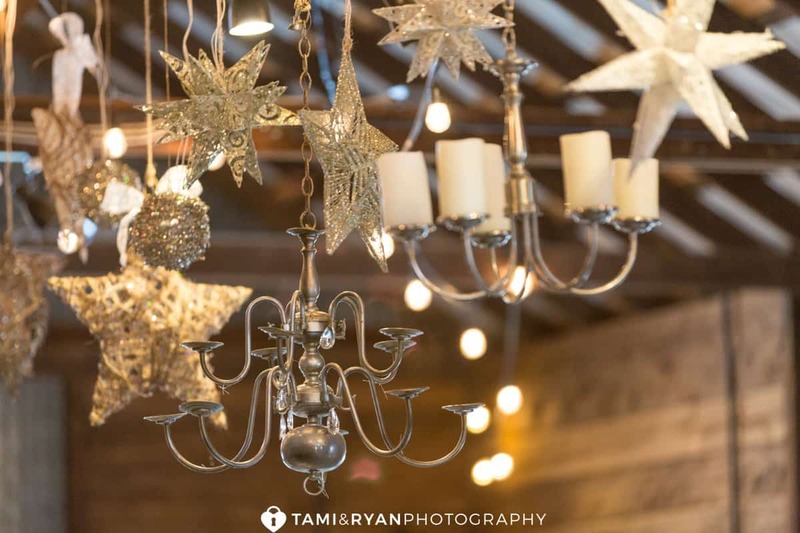 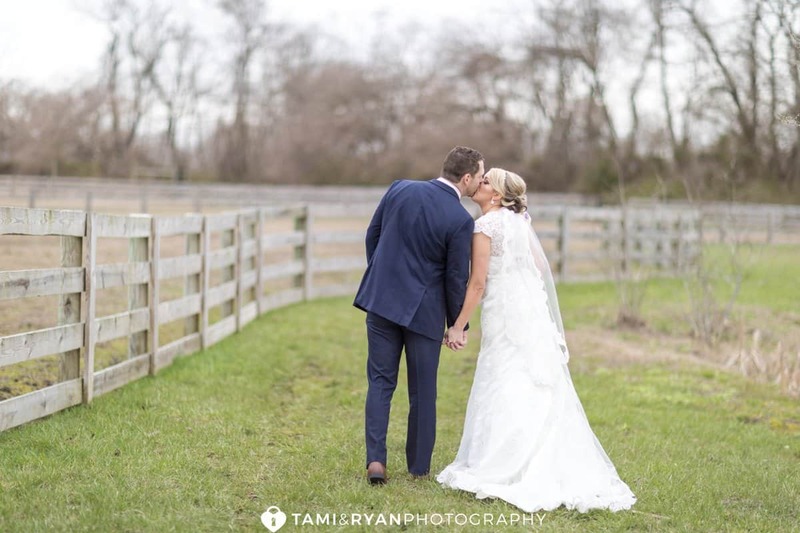 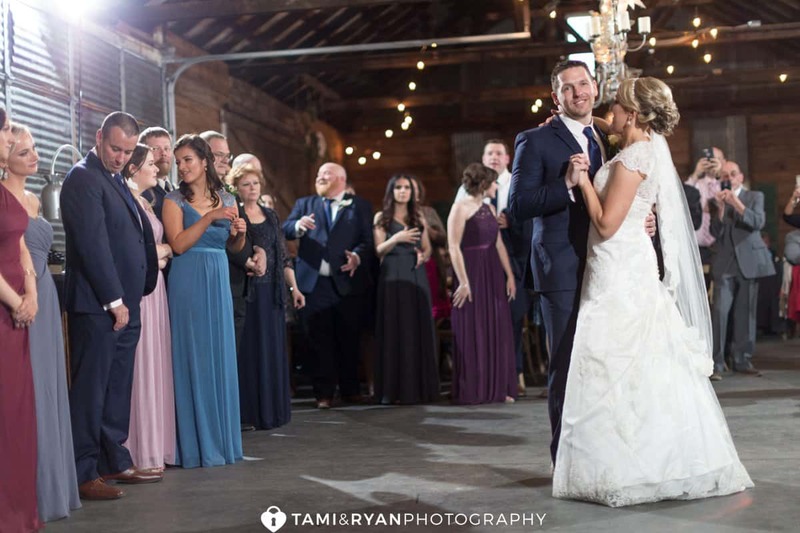 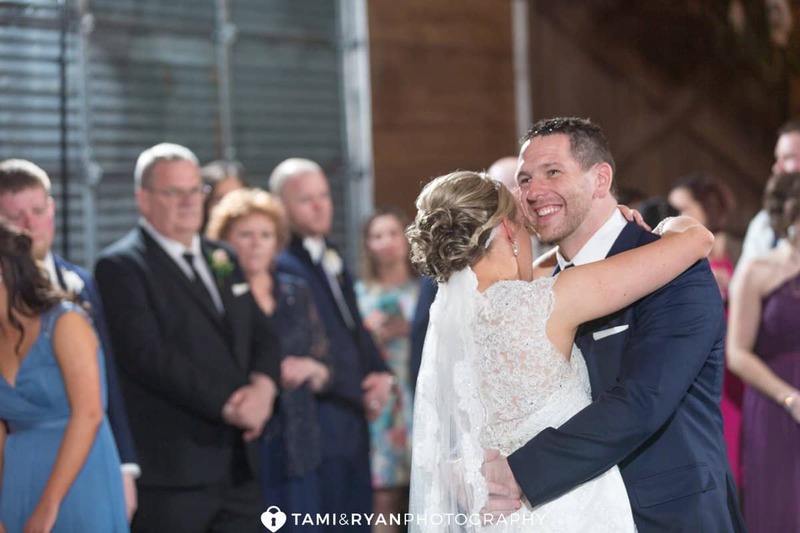 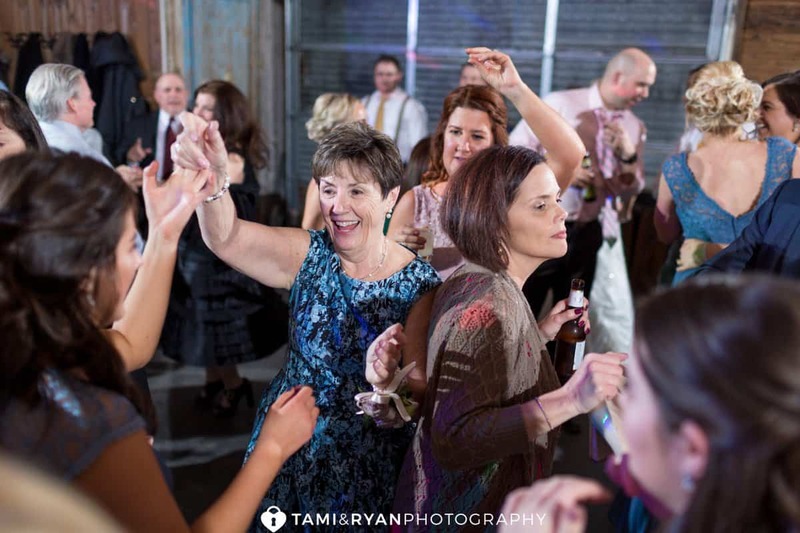 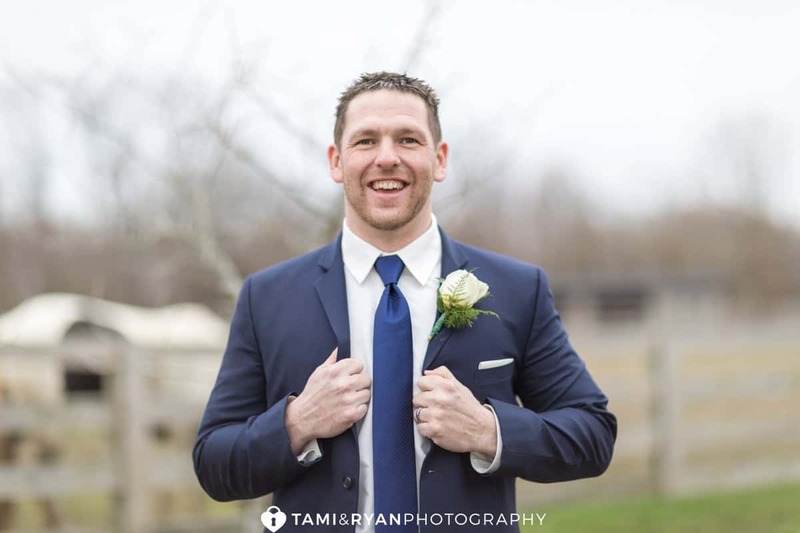 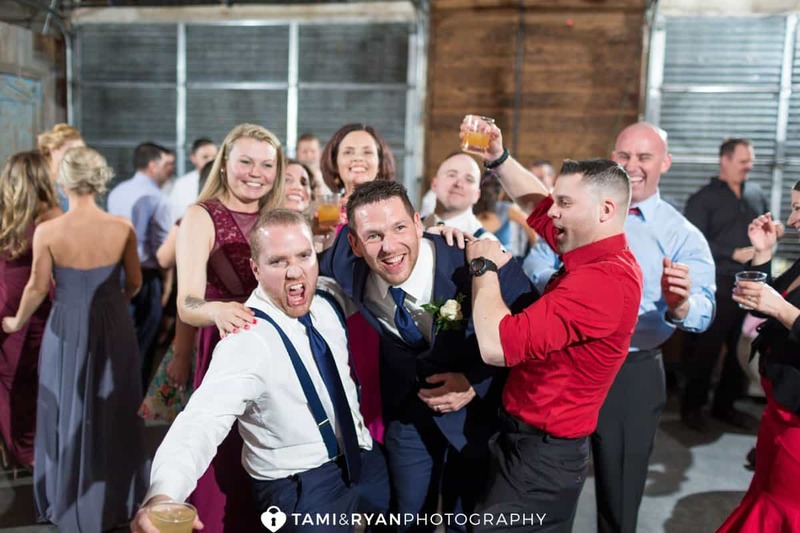 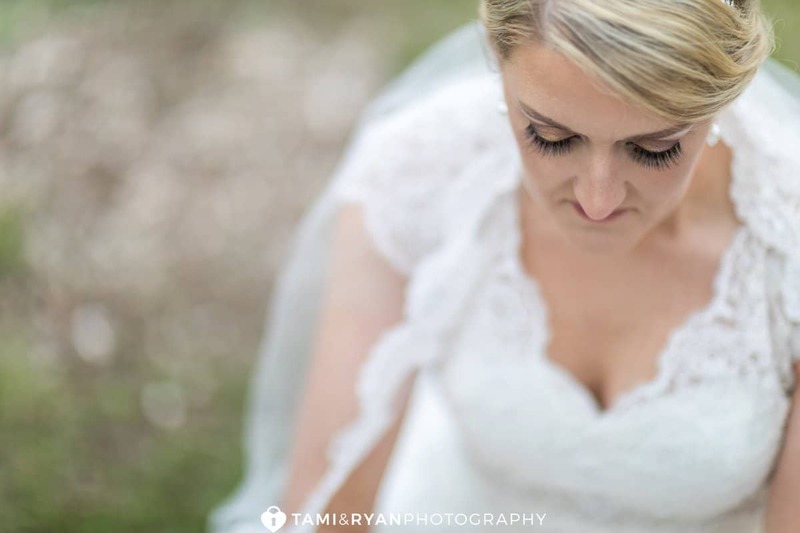 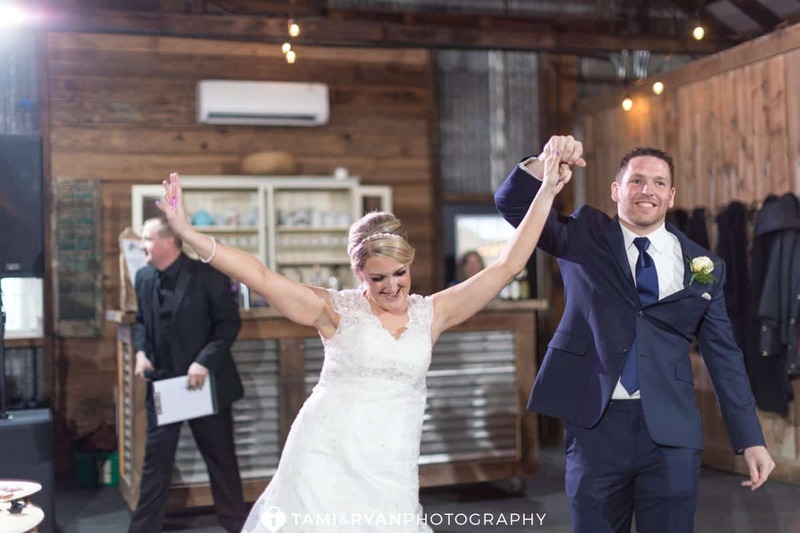 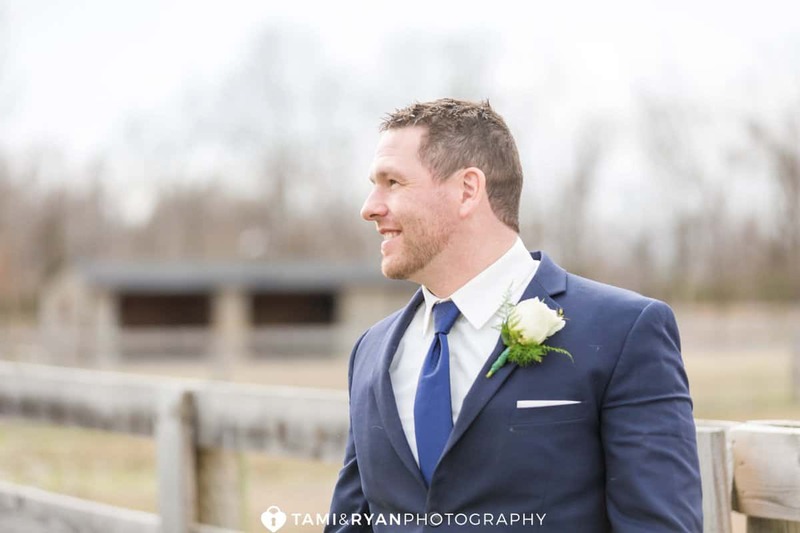 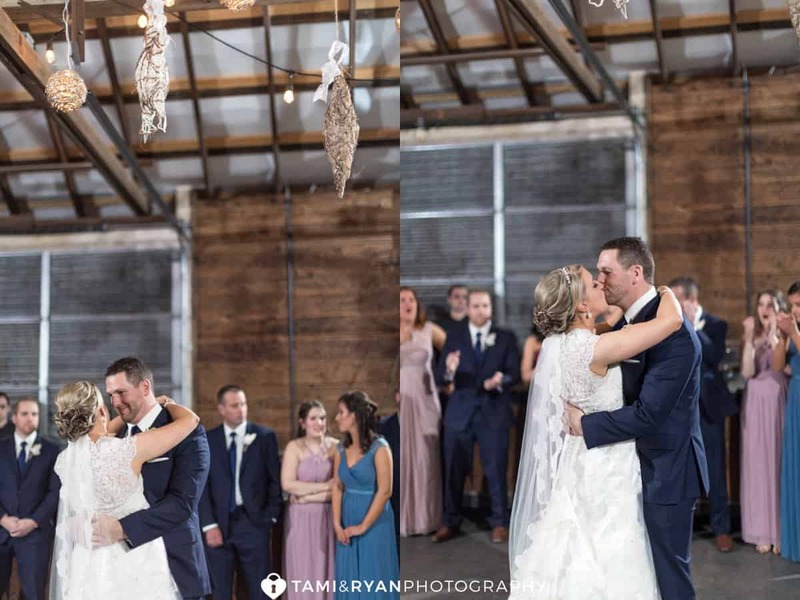 Besides the location being gorgeous, the barn being the perfect venue for all of those barn-loving brides, the staff was absolutely amazing, especially the coordinator, Lizzie. 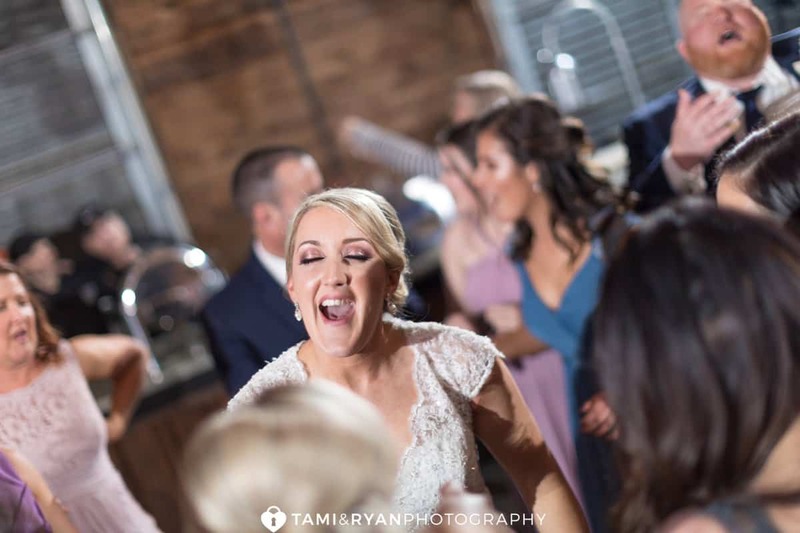 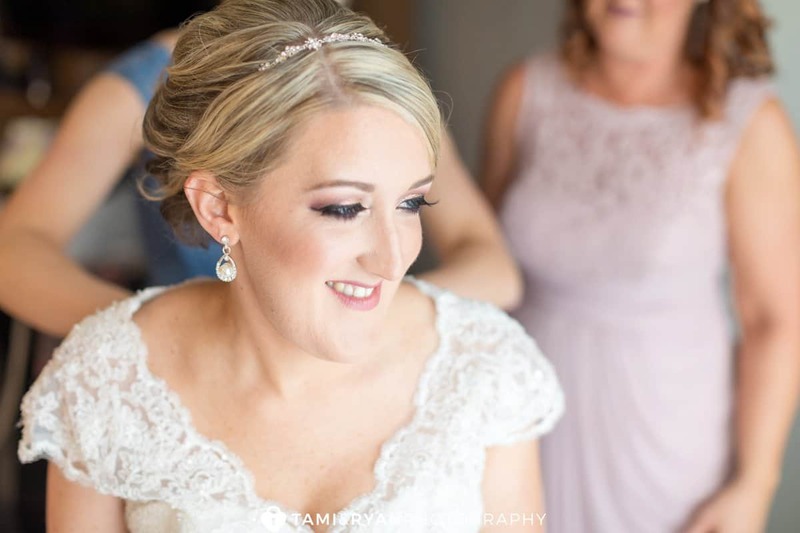 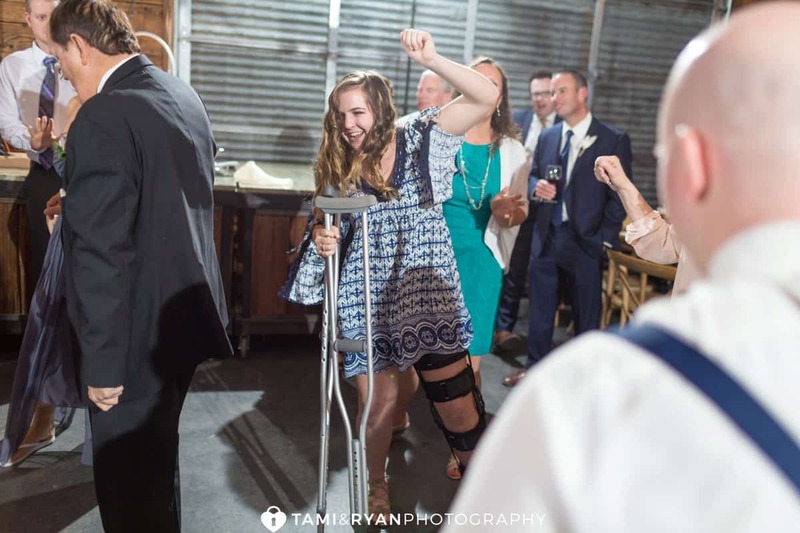 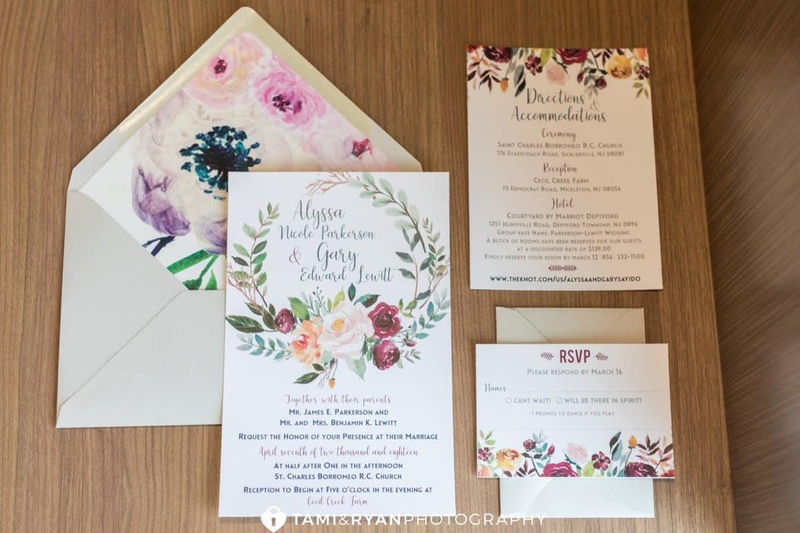 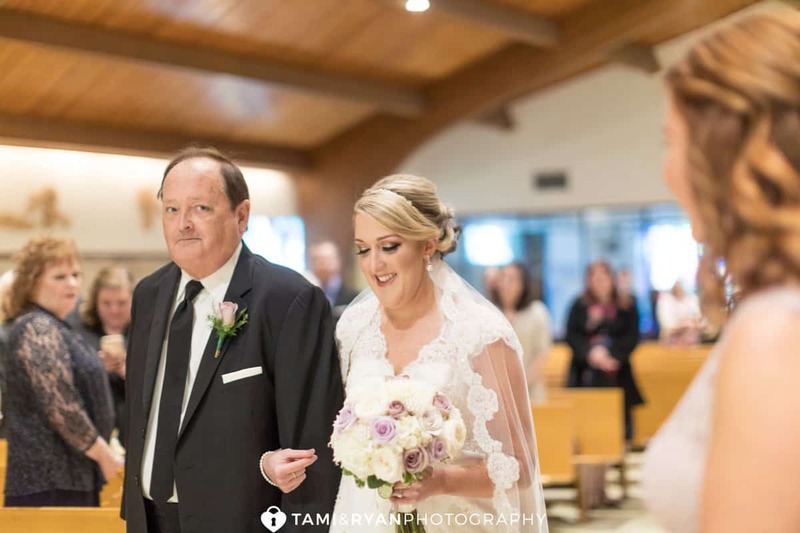 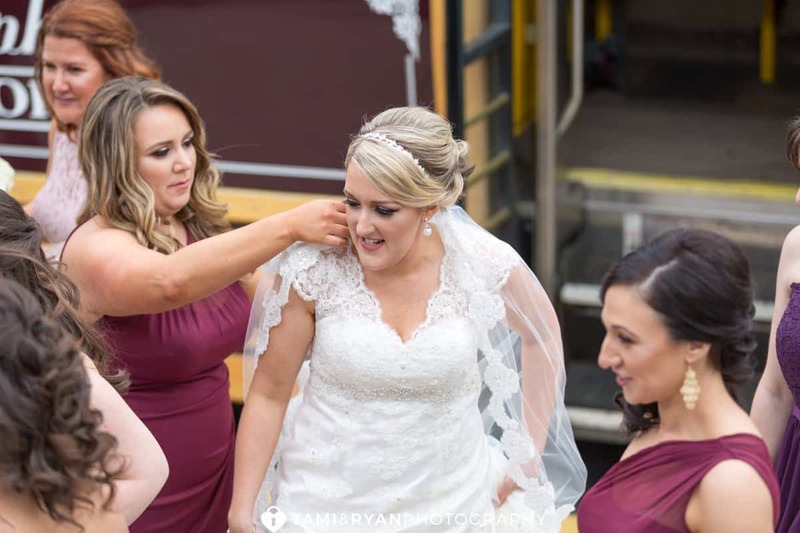 She was a breathe of fresh air with how helpful she was and how much you could tell she loved being a part of her couples wedding day and making sure it was perfect! 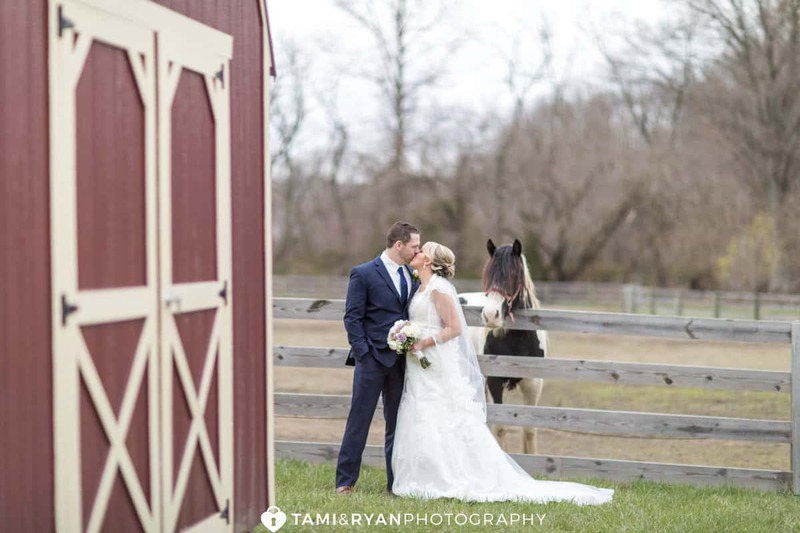 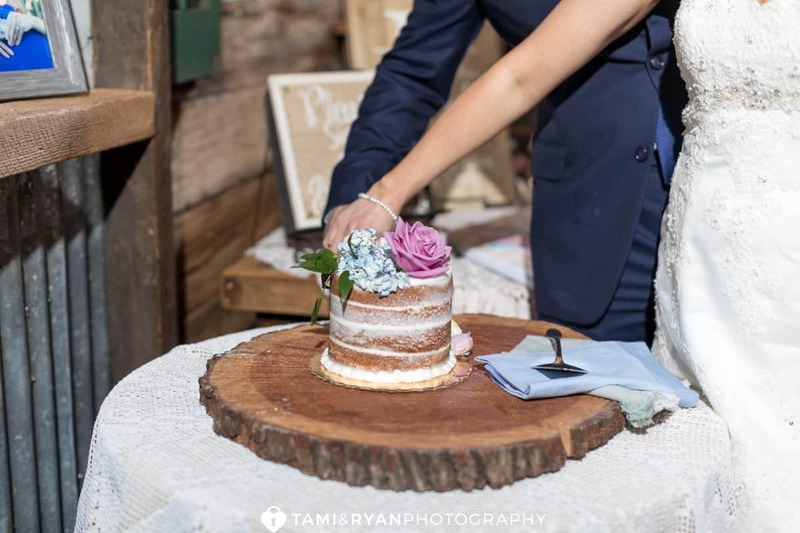 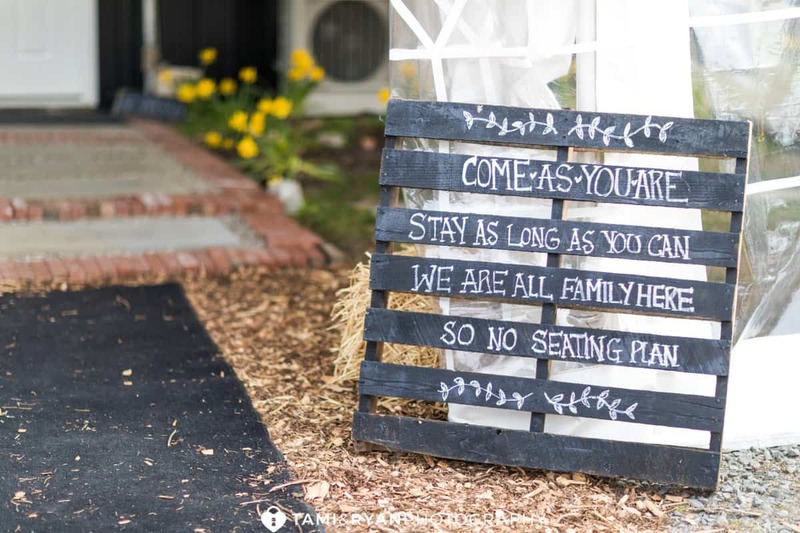 If there was ever a perfect venue for a rustic bride, Cecil Creek Farm is just that! 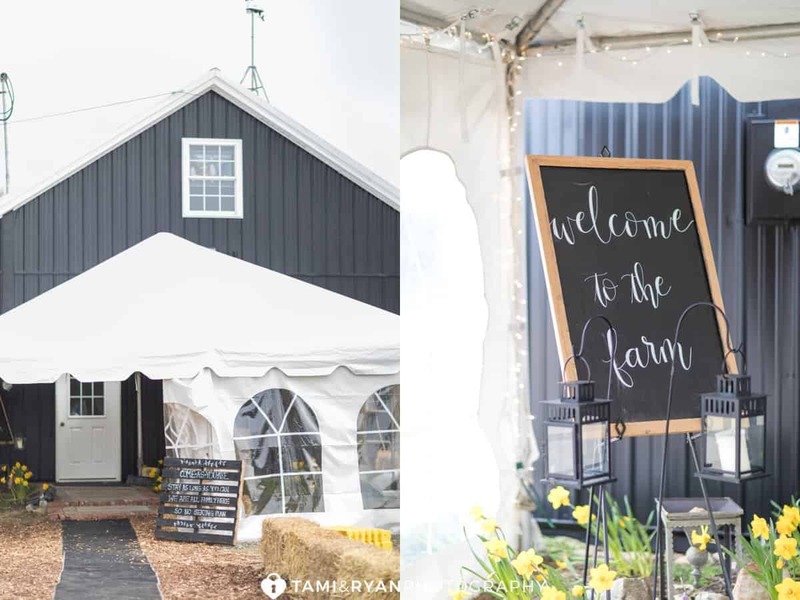 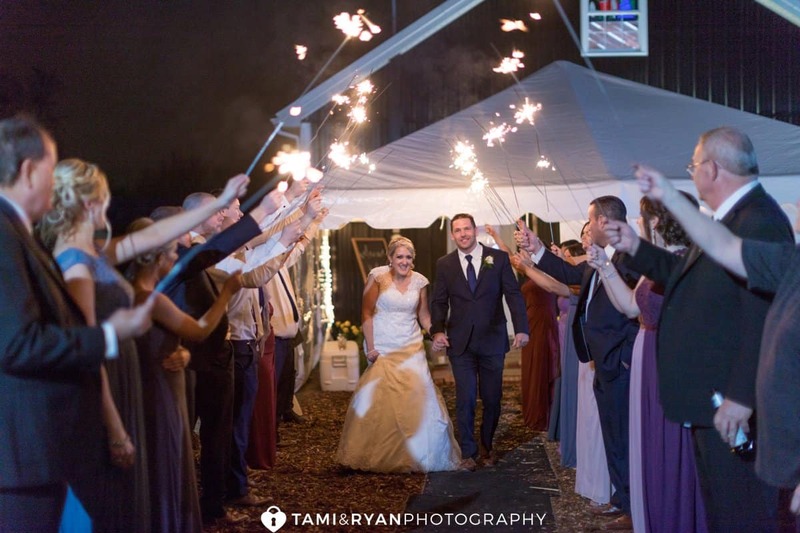 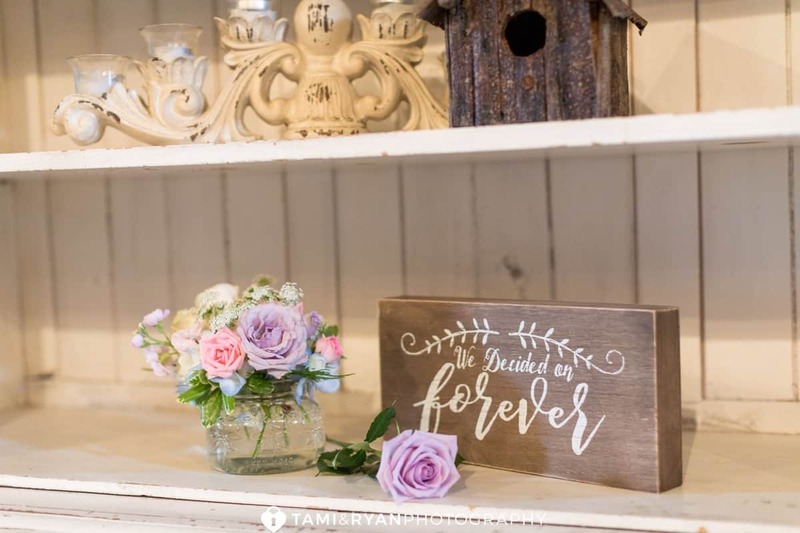 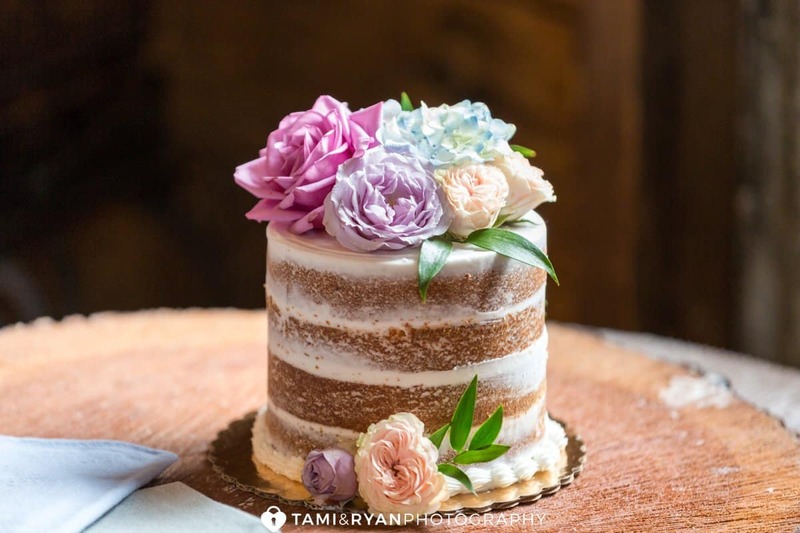 From the full access to their farm, to the beautiful barn for your reception, to the rustic, wooden details inside, it is every rustic bride’s dream! 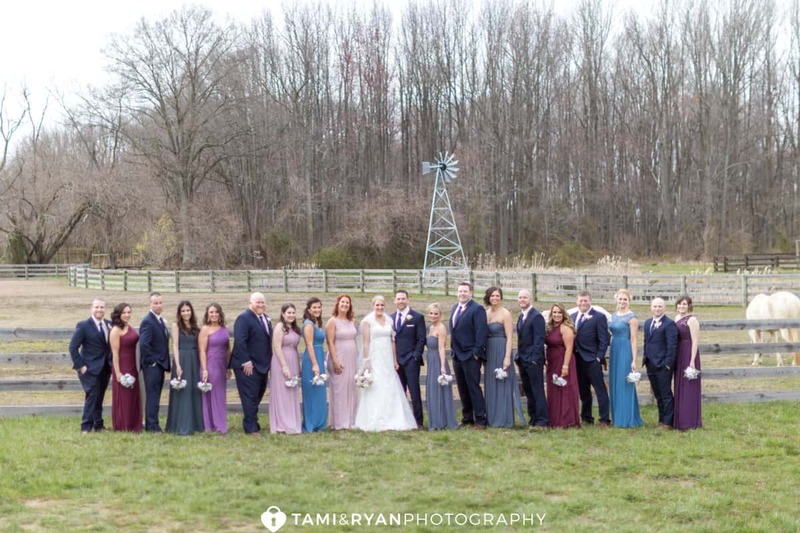 Cecil Creek Farm is a family owned, 42-acre farm located in Mickleton, New Jersey. 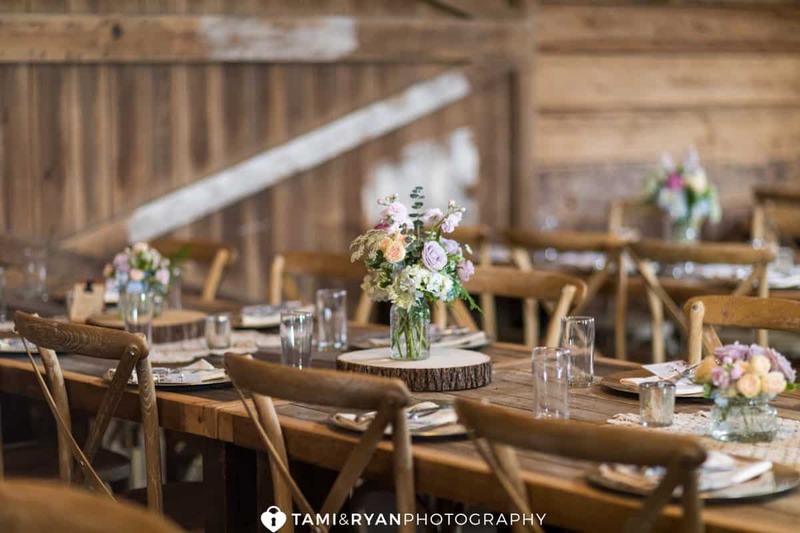 Their talented chef’s that they have on staff, have custom menus that feature freshly harvested veggies and fruits from their fields and other local farms. 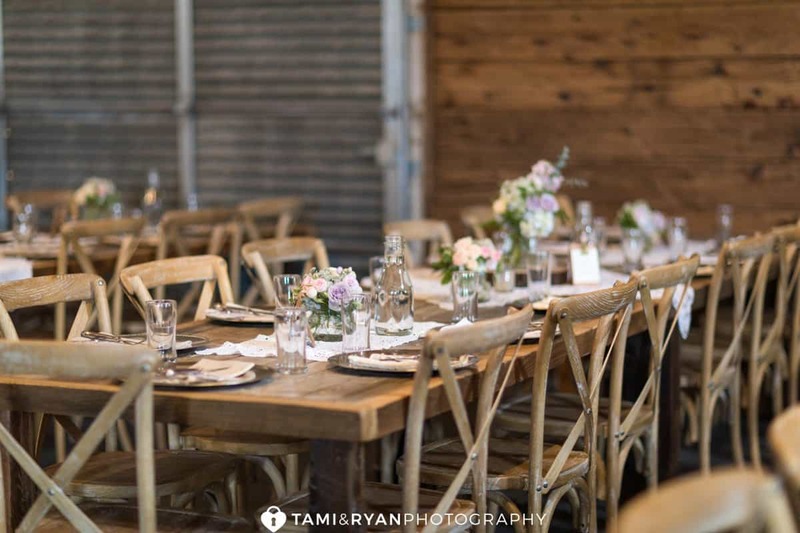 This property has created a community where people could enjoy the beautiful and share the love and food that the owners hold so dear. 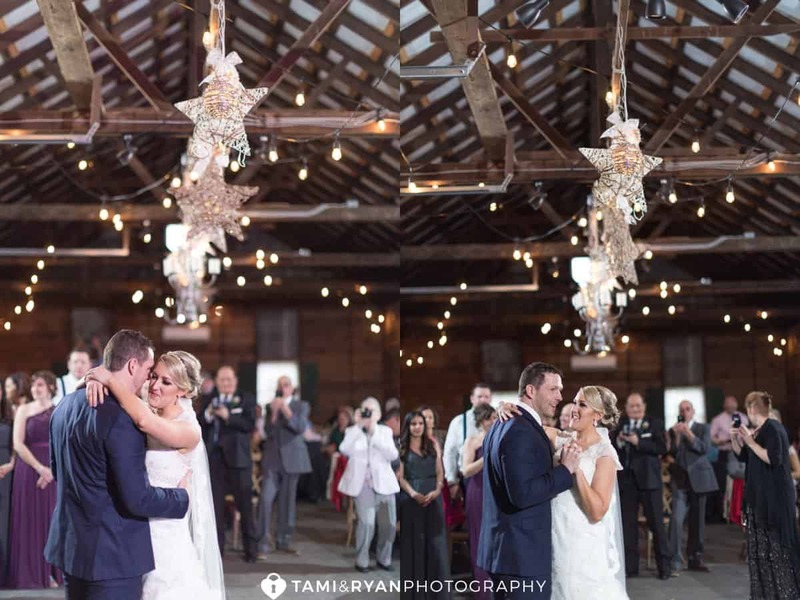 It is an absolutely special wedding venue.